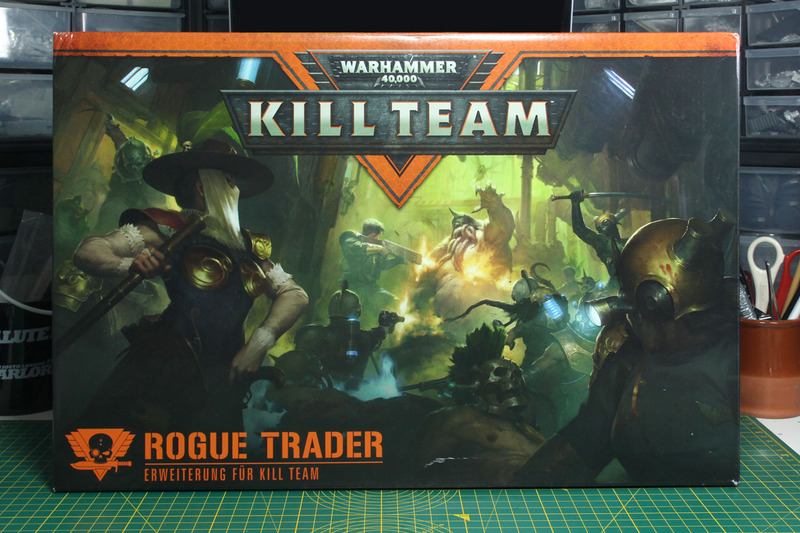 Similar to the Nurgle Rotters, this box was "revealed" at Warhammer Fest Europe as well, the Rogue Trader Expansion for Warhammer 40.000 Kill Team. 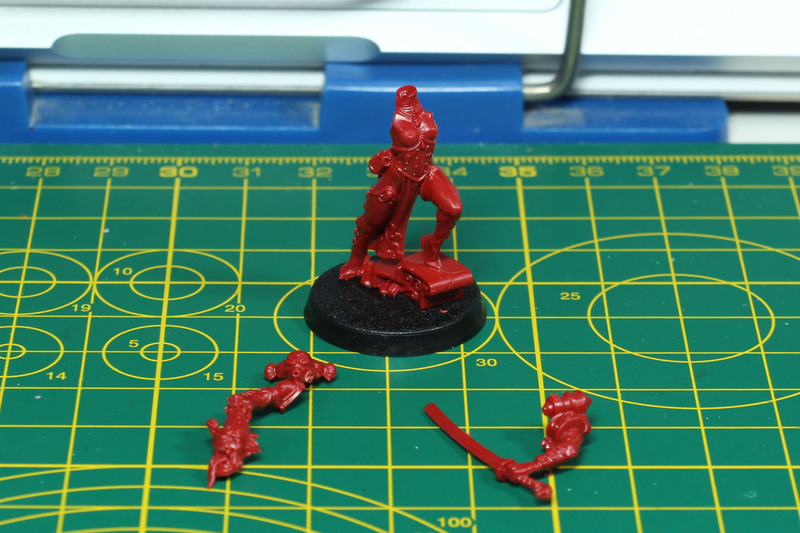 Earlier this year, there was a teaser about Rogue Trader coming back. 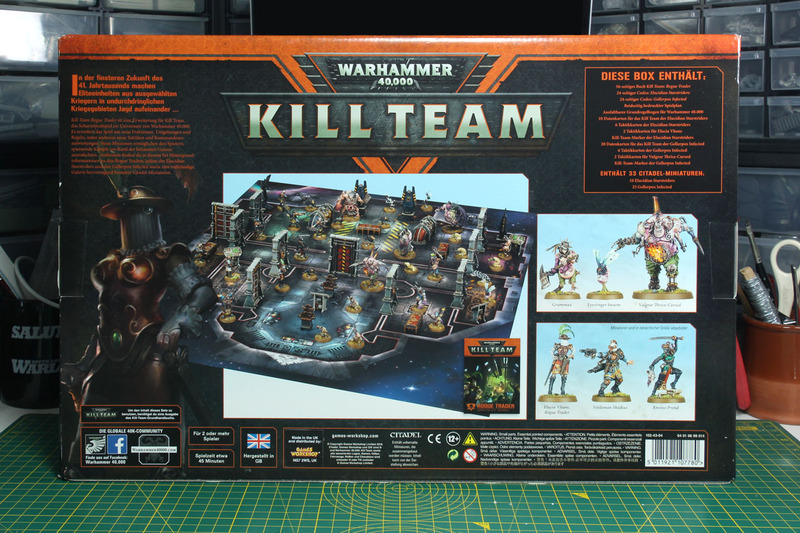 This was before Kill Team was officially announced, therefore it is important to clarify the expectations on this boxed set and what it contains. 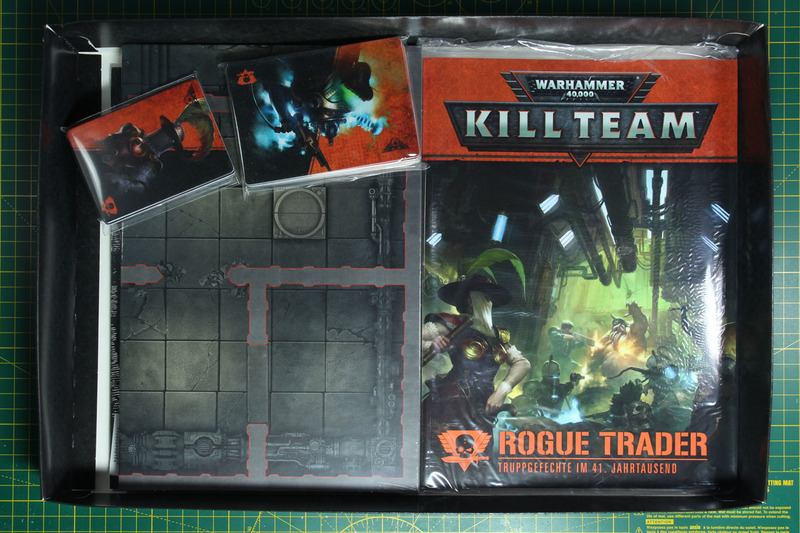 Rogue Trader is an expansion for Kill Team, you will need either the Kill Team rulebook or the Kill Team boxed set, so fully use the content of this box. It is not a stand-alone. 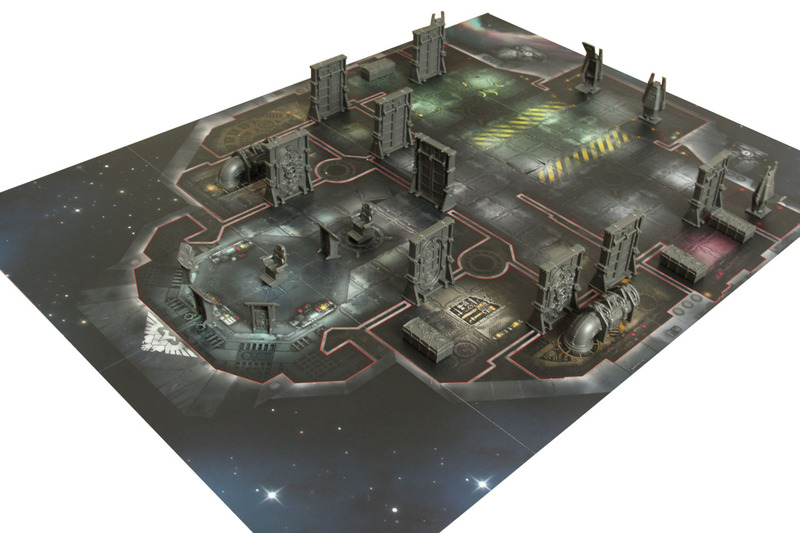 The price of this boxed set is 105 EUR and it is basically two Kill Team forces and a new Kill Zone with its own rules. 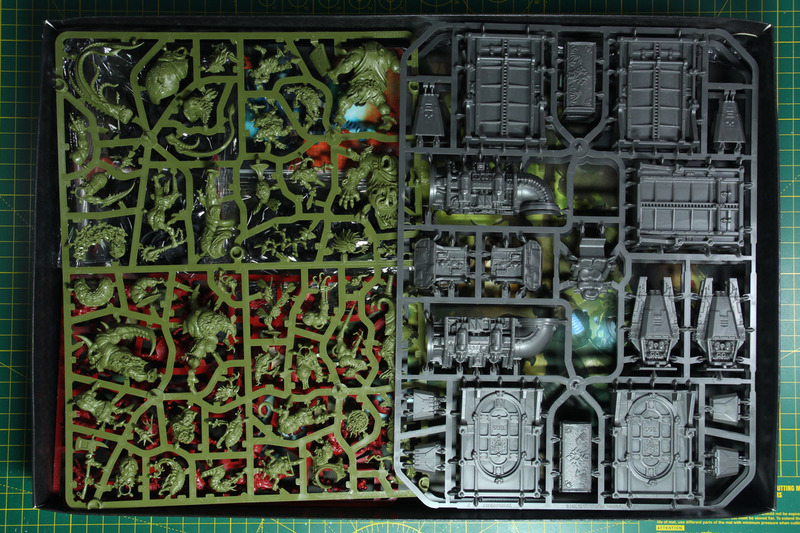 The box is quite heavy and when you open up the cardboard box (which isn't designed like the other boxes, of Necromunda or so, you open the side and slide the cardboard tray out not from the top), you see the terrain sprues and the large green sprue of the Gellerpox Infected and Starstriders. 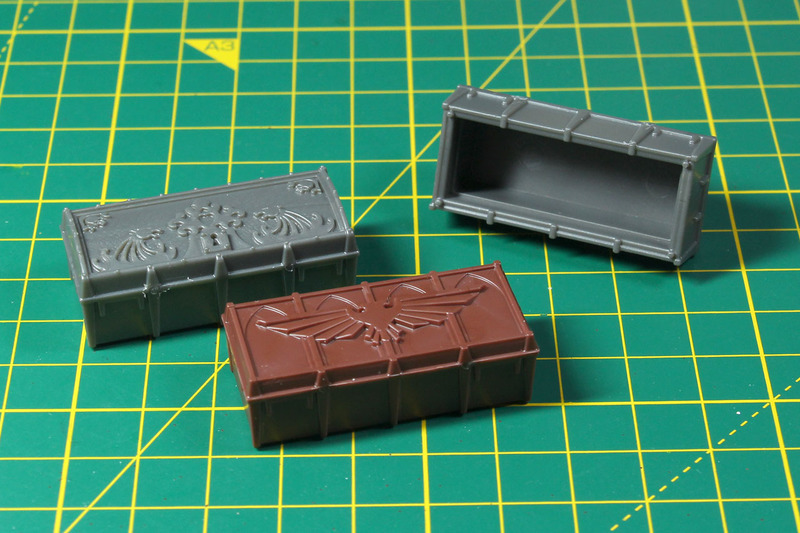 Below that is a larger art print, which is used to protect the content from the sprues and vice-versa. We've seen this with quite a lot of the boxed sets. 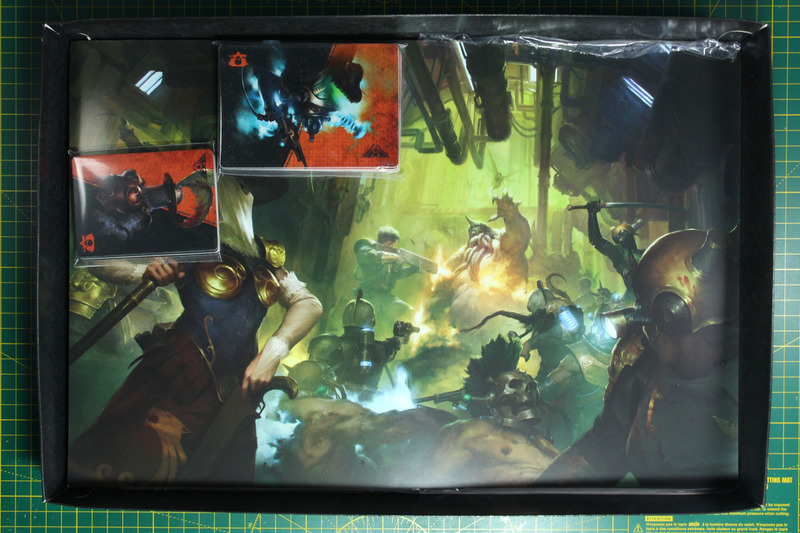 Under that art print are the printed contents of this box, the rules, instructions, tokens, cards and the Kill Zone floor plan. There are several booklets in this box. 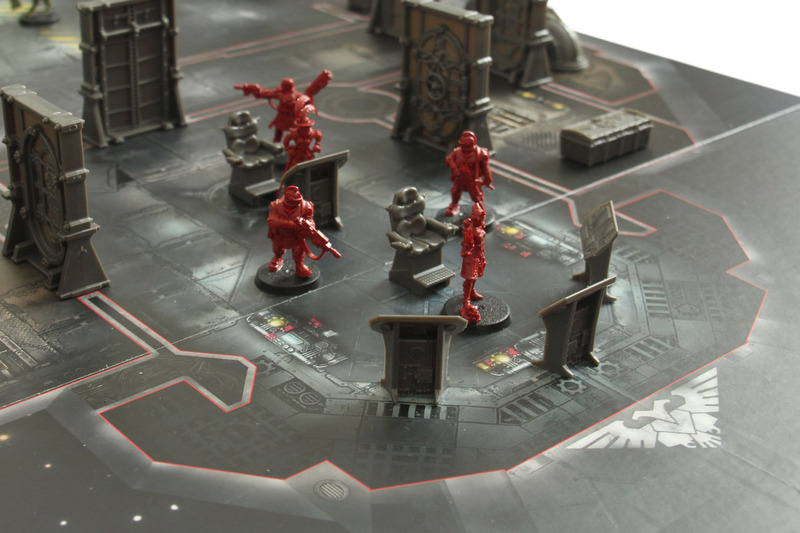 You get the 56-page strong Kill Team rule expansion, covering the rules of the ultra-close battlezones of the Truehawk and Ministorium Shrine (the two sides of the game board), the rules for the two kill teams incl. 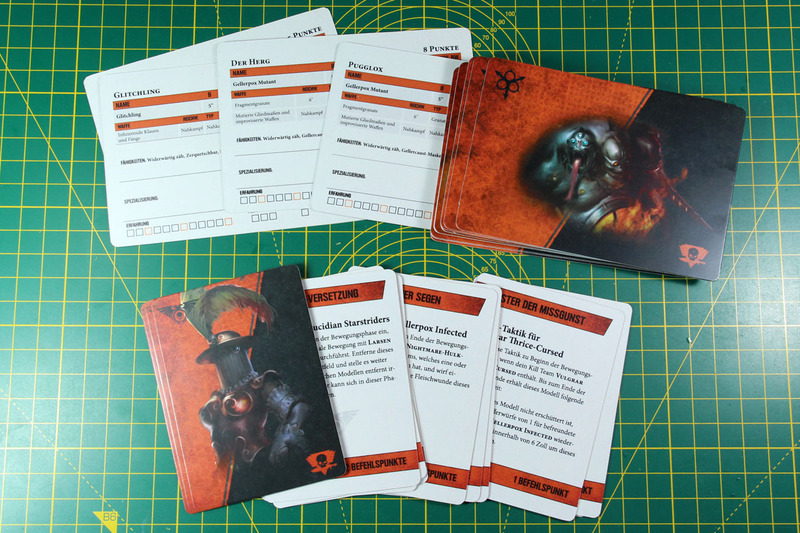 data cards, missions and a first snipped of the Commanders rule. 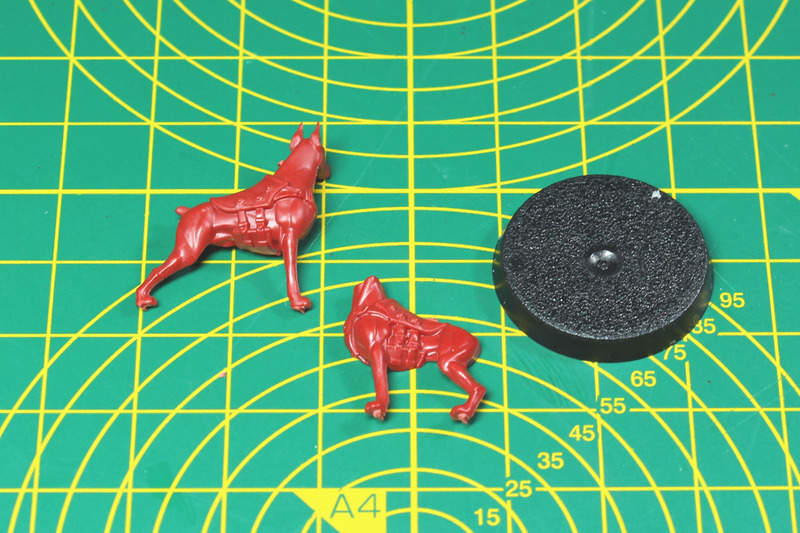 The assembly instructions only cover the assembly of the miniatures and not for the terrain. For the use of the two small forces in Warhammer 40.000 they included two 24-page Codex booklet covering datasheets, unique stratagems etc. As well as a 16 page Warhammer 40.000 core rule booklet to let you get a feel for the rules. 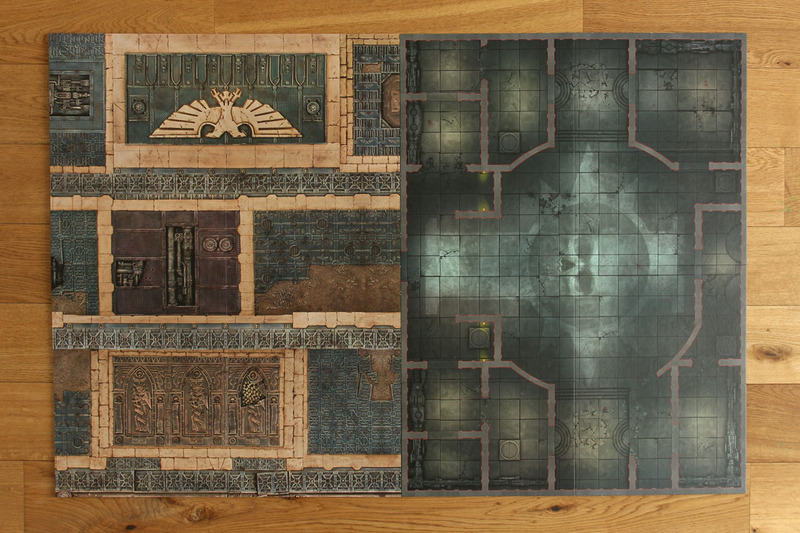 There are two sheets of tokens, for each of the factions and a double sided game board, covering the Truehawk (the Rogue Traders space ship) and a temple of the Ministorium. 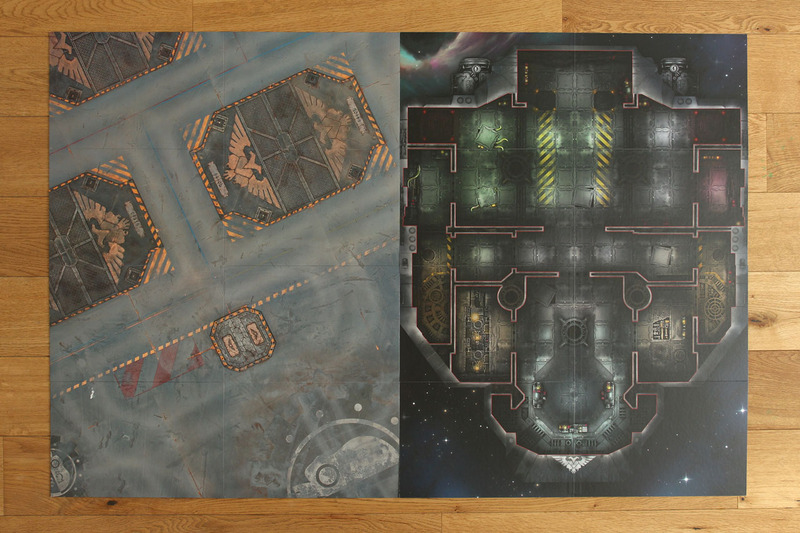 The double side game board is the same size as the Kill Team / Kill Zone boards. They can be combined and mix the rules for the indoor / ultra-close confines scenarios. 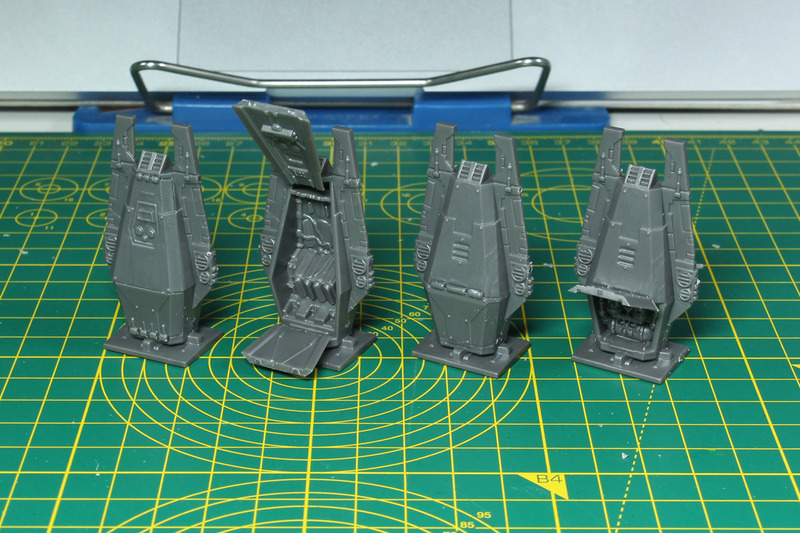 For example the edge of an imperial city with an attached temple, or the hangar with a space ship ready for take-off. 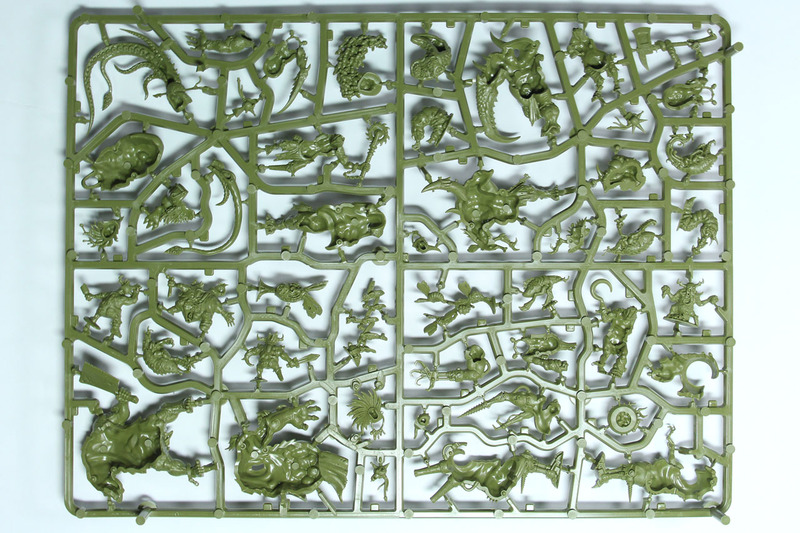 Warhammer Community covered the topic of combining the boards in a recent article. 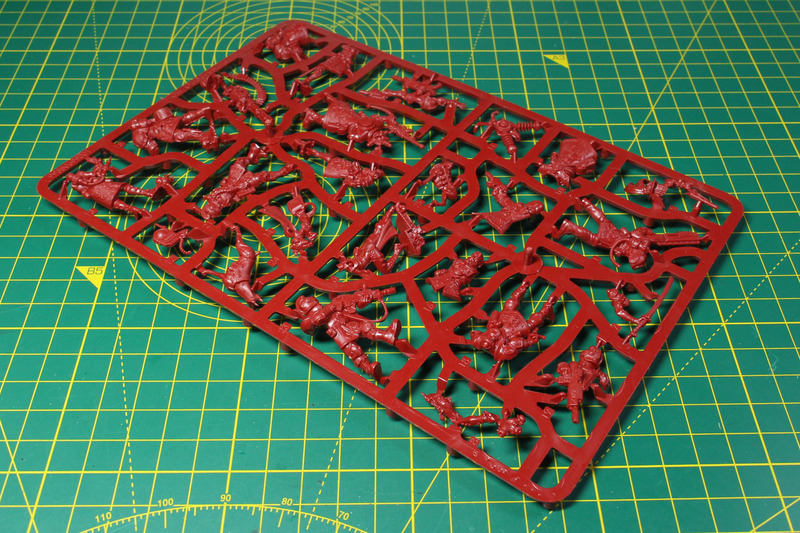 There are a total of 4 sprues in this box. 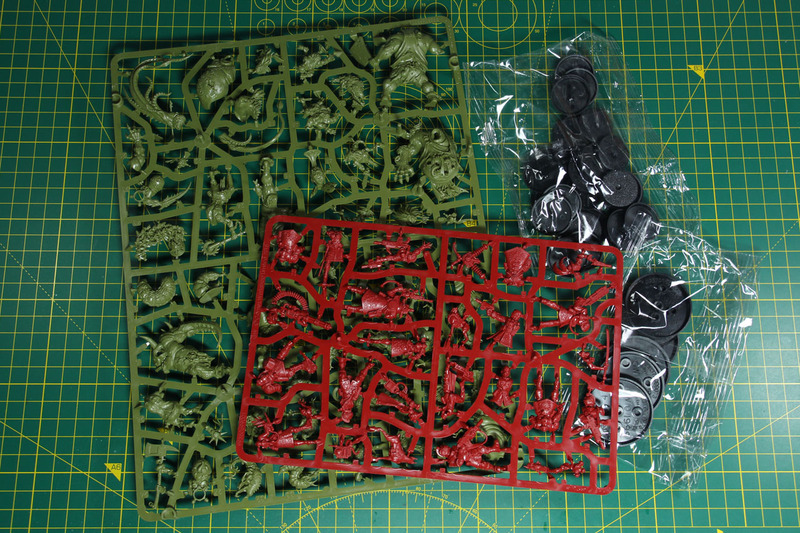 Two identical terrain sprues in metallic-grey, a medium sized red on with the Rogue Traders and a large green one with the Nurgle infested. 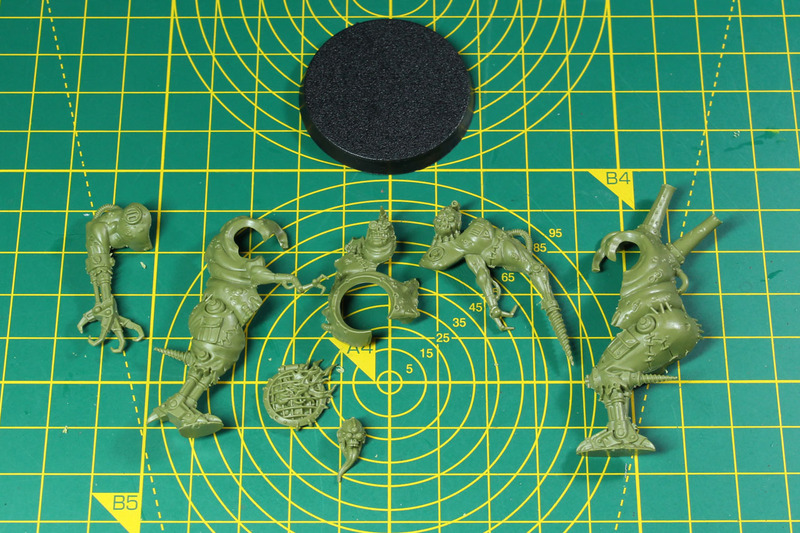 Casting is on a high level, there were almost no mould lines on the Elucidian Starstriders and only a few with the Gellerpox Infected. 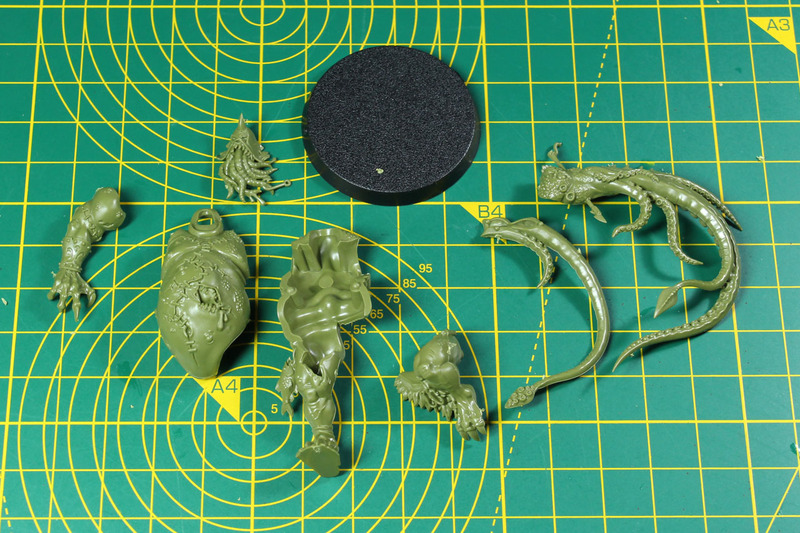 The sprues are properly filled, I was a bit surprised that the Starstriders were packed so densely. 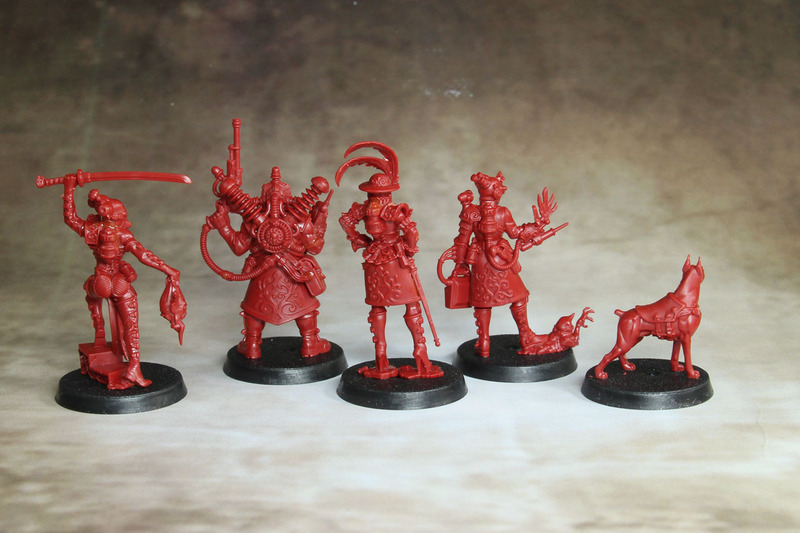 The Starstriders are a 10 miniature warband, the Gellerpox are a warband consisting out of 7 large infantry miniatures and 16 critters. 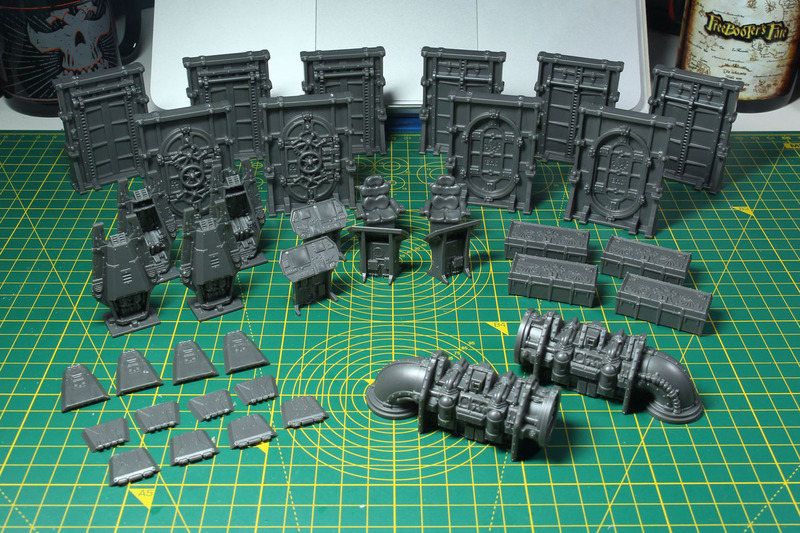 This is the total haul of the two terrain sprues. The assembly instructions do not cover the terrain pieces. 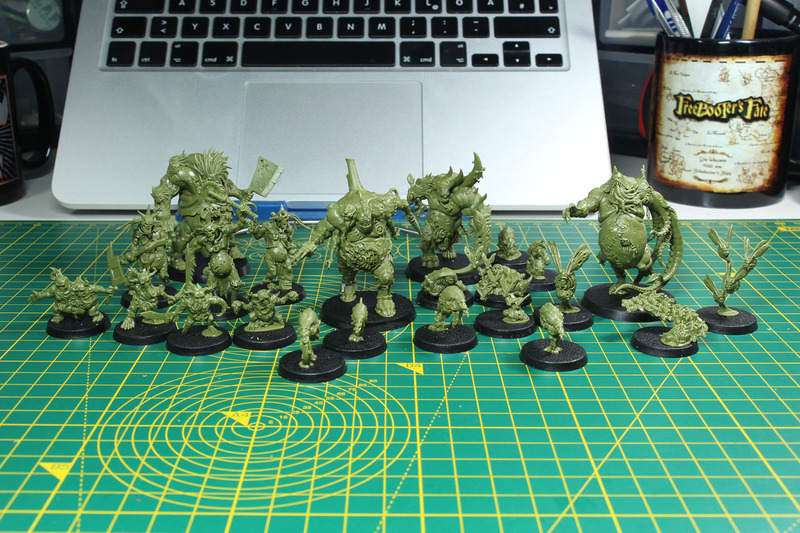 Beside the escape pods and the pipeworks, they do not need assembly. 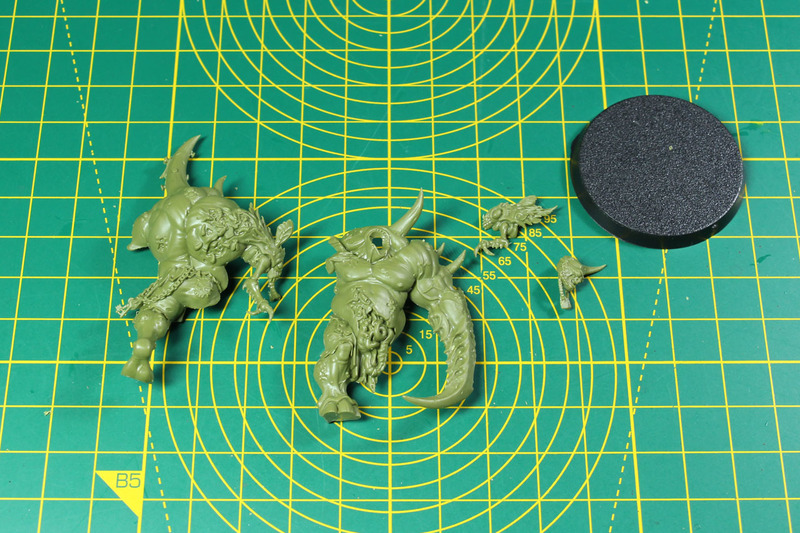 Still, an overview or something would - especially for newcomers to the hobby - helpful. There are two different styles of doorways, 4 with rounded doors and 6 with rectangular ones. 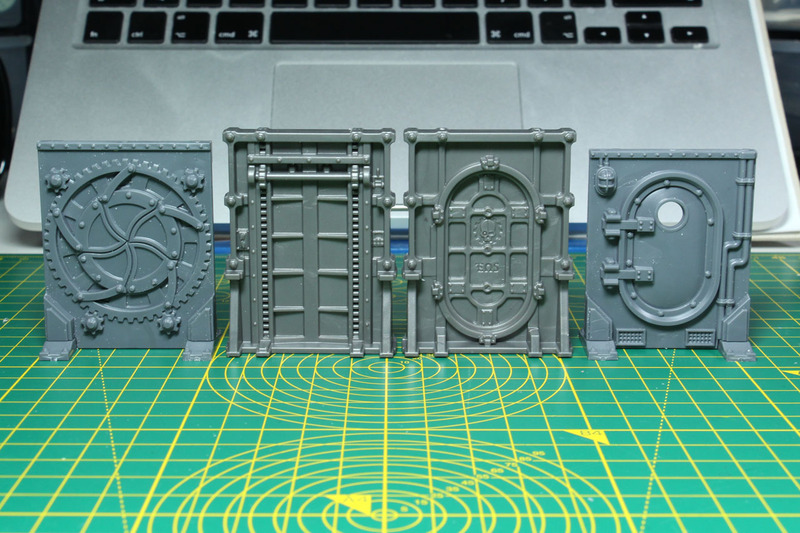 The doorways aren't the same size as the ones from the Necromunda set, as you can see in the second picture. There are 4 chests with the crest of Elucia Vhane. 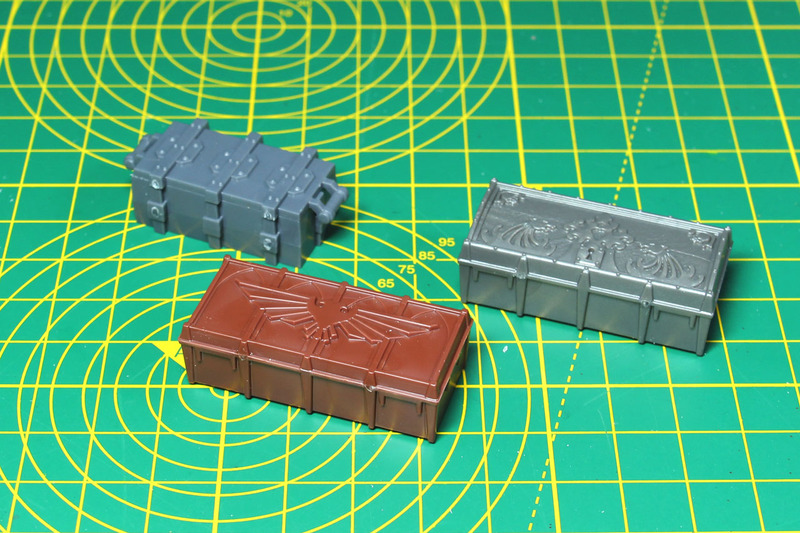 They are basically the crates from the Munitorum Armoured Containers, with a different top lid. 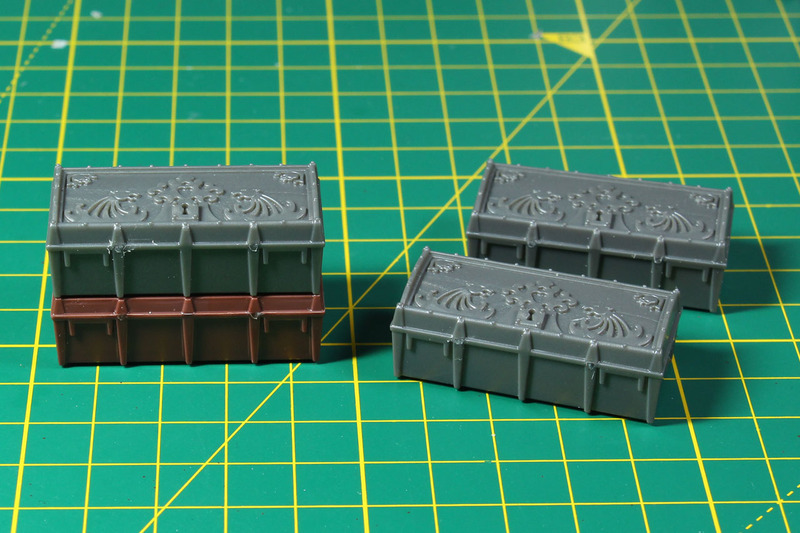 Due to the domed lid of the chest, you cannot stack them like the ones from the Munitorum. 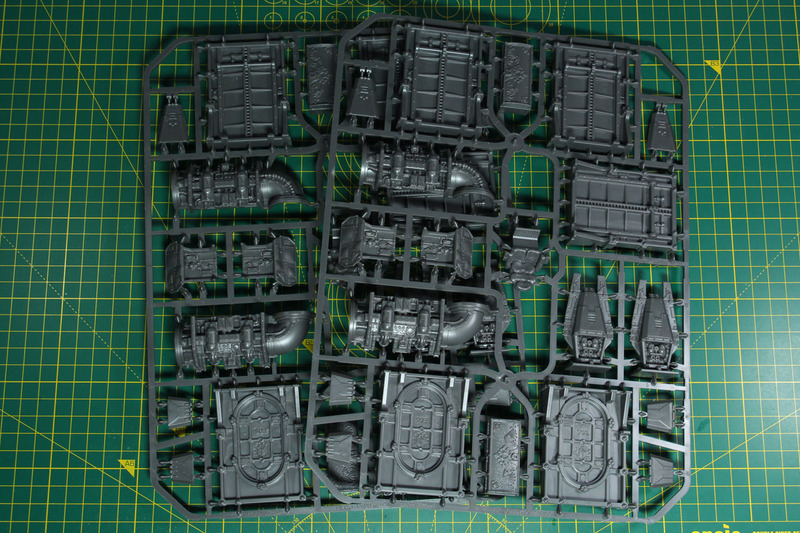 The Necromunda crate is just in there for comparison (first picture, top left). The 4 escape pods come with three doors. As mentioned above, it would be helpful if it would be explained if you need these open or closed for specific scenarios. The assembly is self-explaining and I went with two closed ones, one open front, one open back. 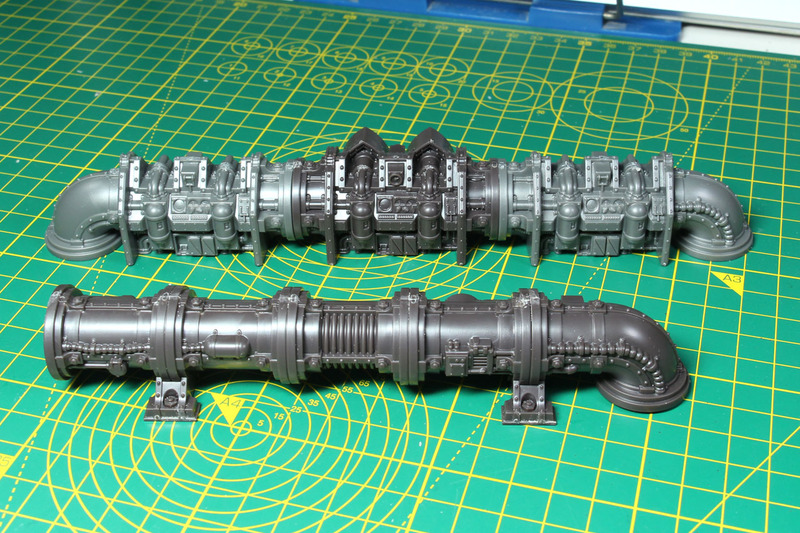 The two identical pipework elements are kept in the design of the Thermic Plasma Conduits, (we've covered them as part of the Kill Zone Sector Mechanicum review), and actually are repurposed from the backside of the control panel along with a short addition of a pipeline curve. 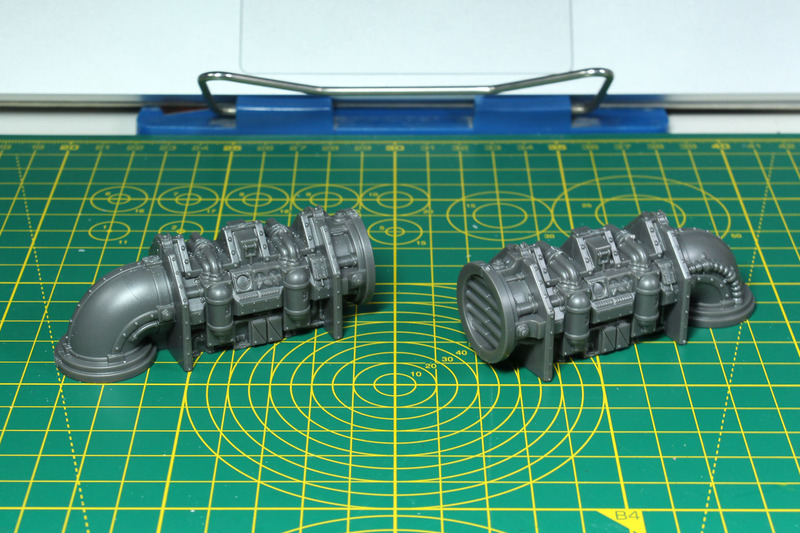 These pieces are compatible with the other parts of the thermic plasma conduits. 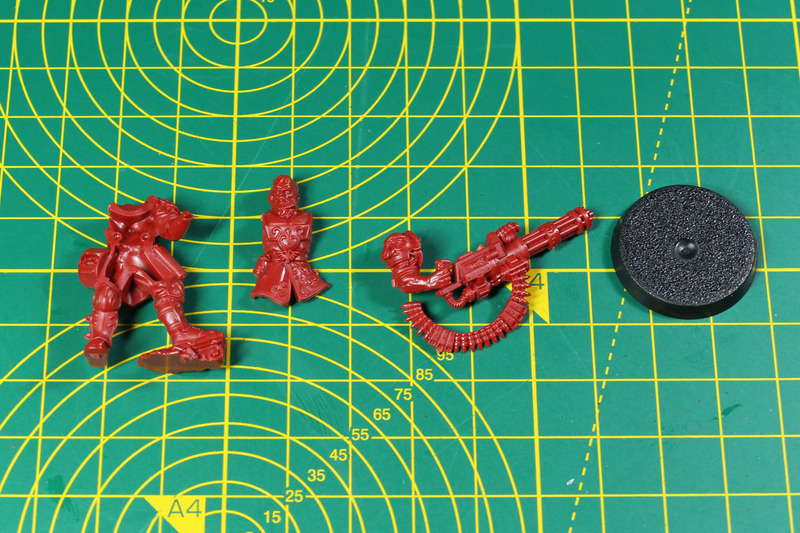 Let us take a look on the miniatures of this kit. The plastic is pre-coloured like we've seen it with a lot of introduction sets and the Underworlds series. 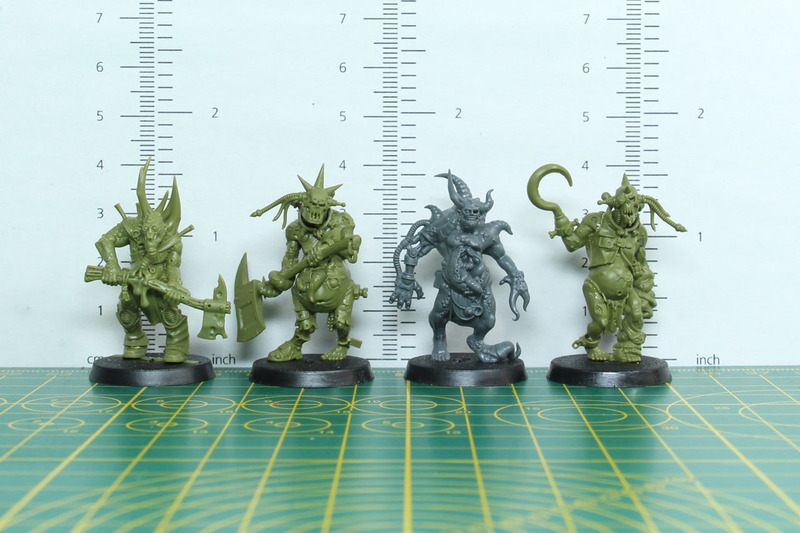 But these are regular miniatures, pre-posed but not push-fit. 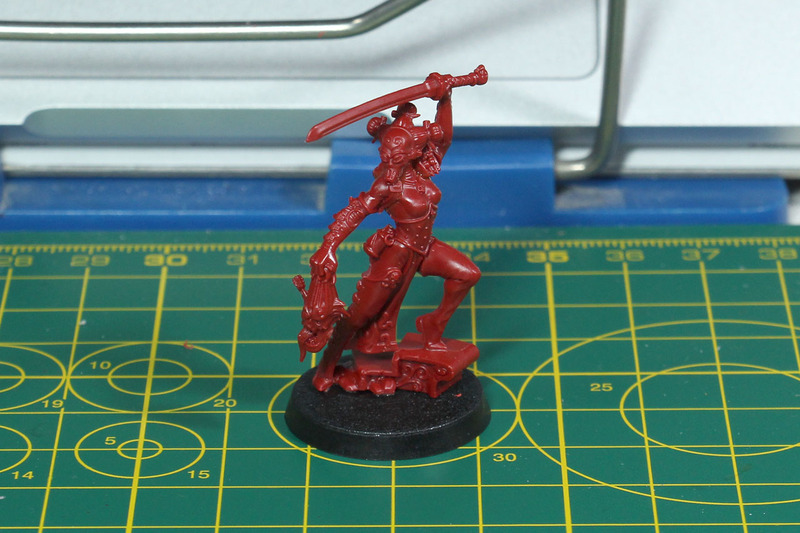 The Rogue Trader leading the Elucidian Starstriders is Elucia Vhane. A three piece miniature on high heels. 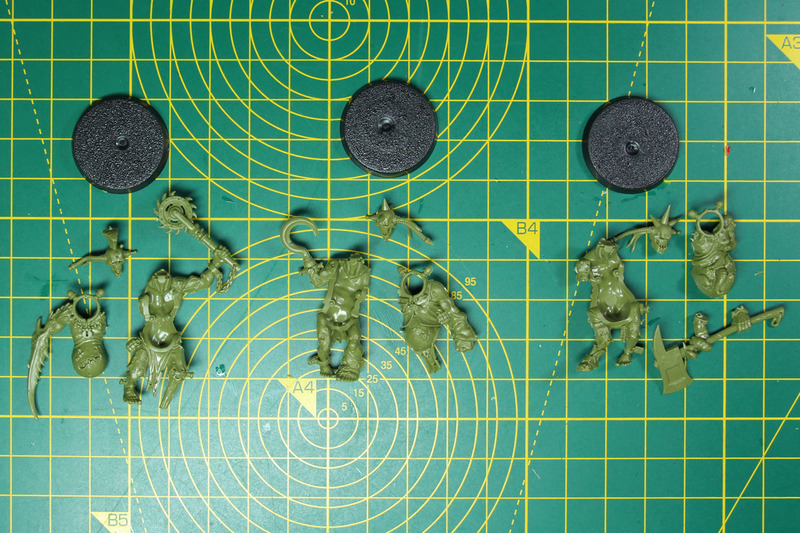 The miniatures do not have slabs and are glued on top of the bases. 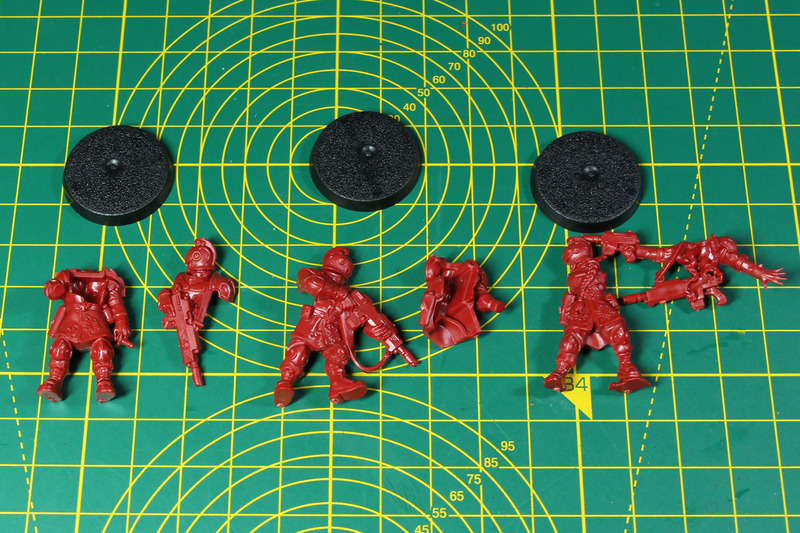 The bases for the Starstriders are regular 25mm round bases without further design. 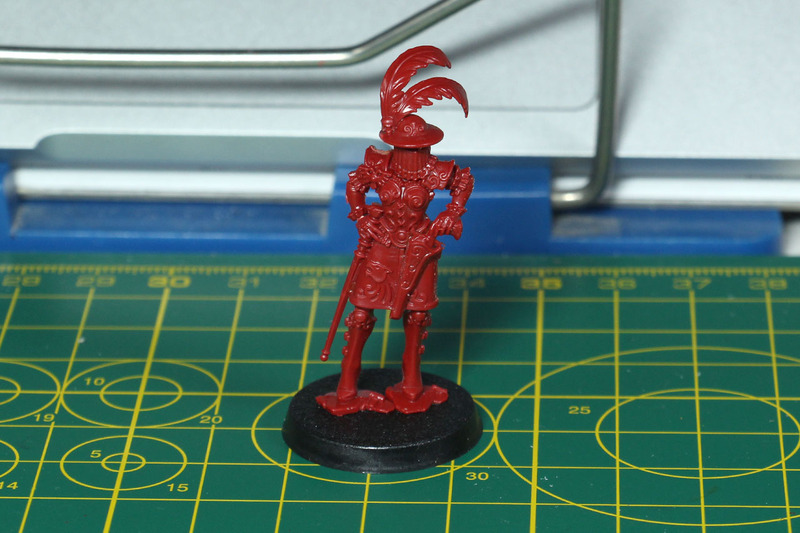 Elucia is armed with an heirloom pistol and monomolecular cane-rapier. Knosso Prond is a Death Cult Executioner, and Elucia's Champion. Wielding a Death Cult power blade and the severed head of one of your enemies, she's standing in an aware attack pose. Good fit and dynamic pose. 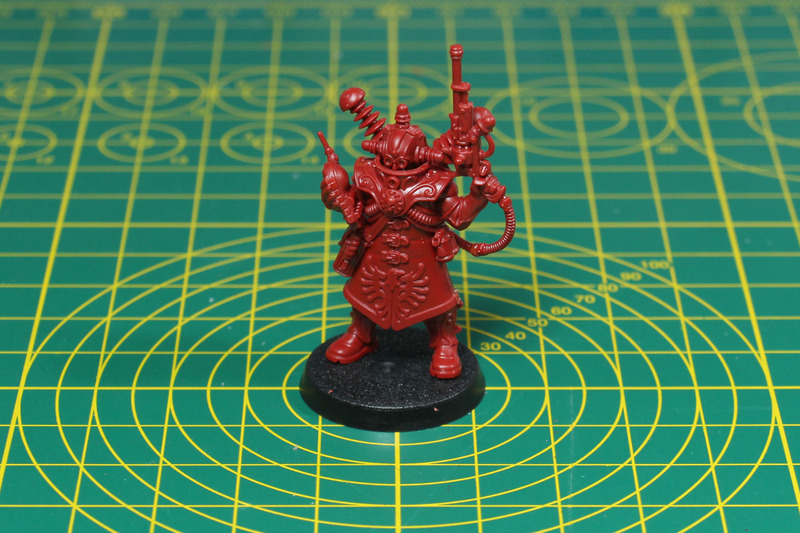 A less dynamic pose has Larsen van der Grauss, an Adeptus Mechanicus Lectro-Maester. He has a scanning device and voltaic pistol. With his stoic pose, he looks a bit flat and like a human tesla coil. 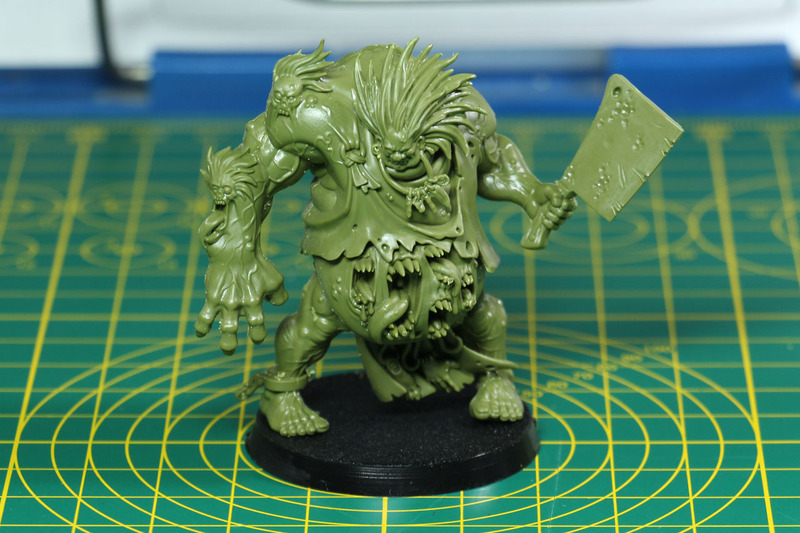 The miniature would be more impressive, if they made him stand like in the artwork on codex page 14. Another important and named member of the crew is Sanistasia Minst, the Rejuvenat Adept. Like a medic or apothecary of the ship. 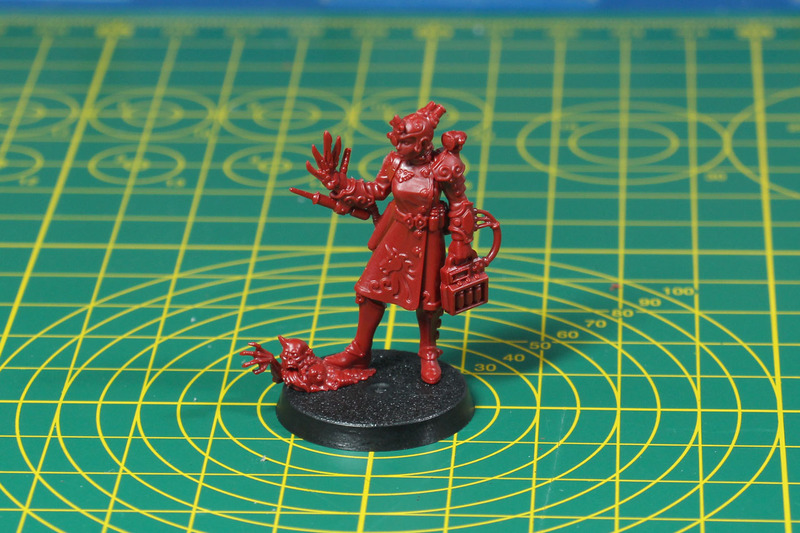 Quite combat ready with her scalpel claw and laser pistol, she has the ability to heal befriended model of her unit. 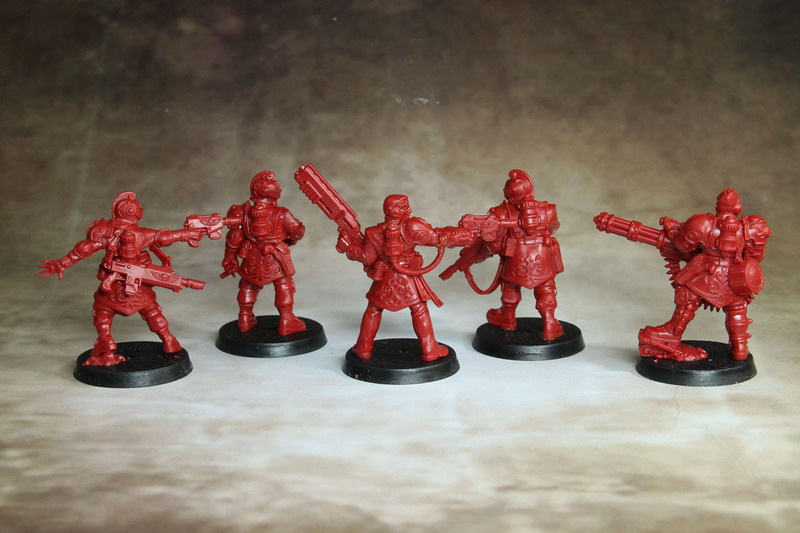 Elucia has her own wing of men-at-arms, or in case of the spacefaring Rogue Traders the Voidsmen-at-arms. In case of the Truehawk this squad is led by Voidmaster Nitsch. 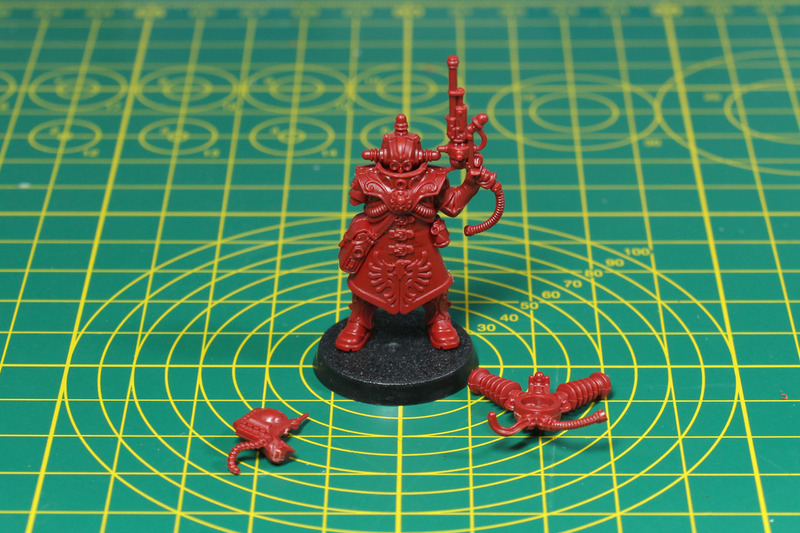 He is armed with an artificer shotgun and laser pistol. 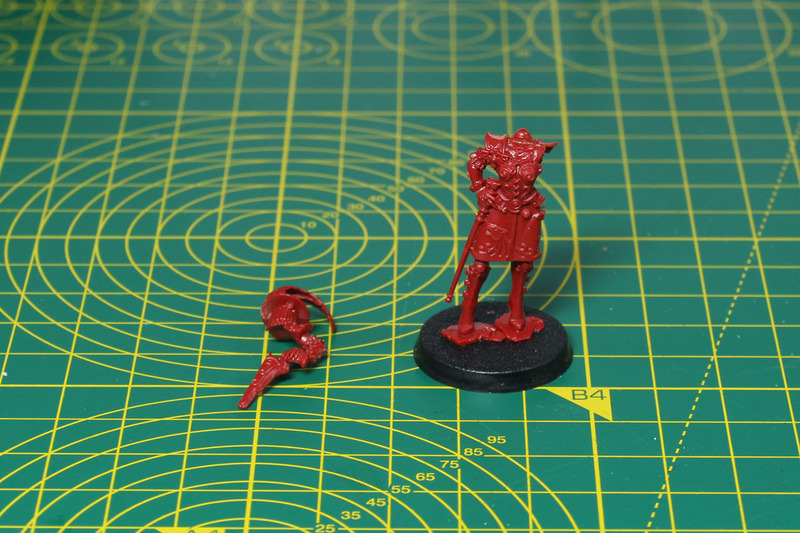 The pose of the two part miniature is very flat and outmoded. 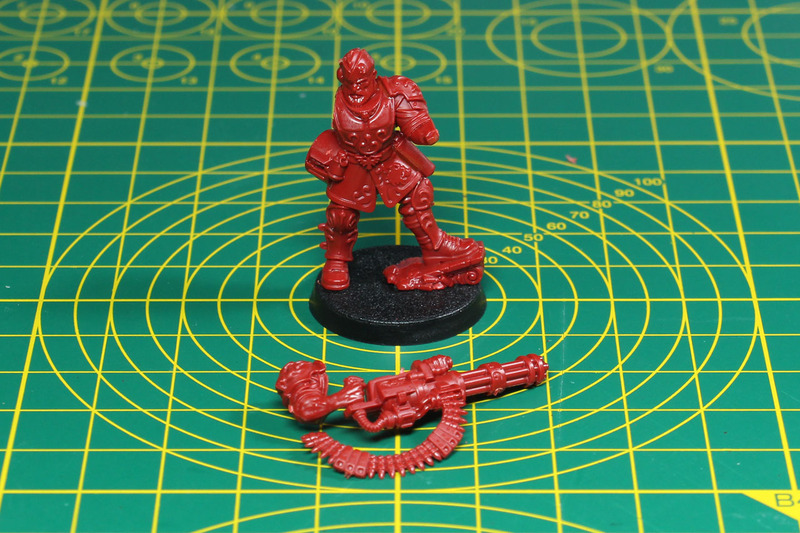 If the sprue was larger, he could have had a more than just two pieces and a more dynamic pose. Think of the pose of the Commissars. 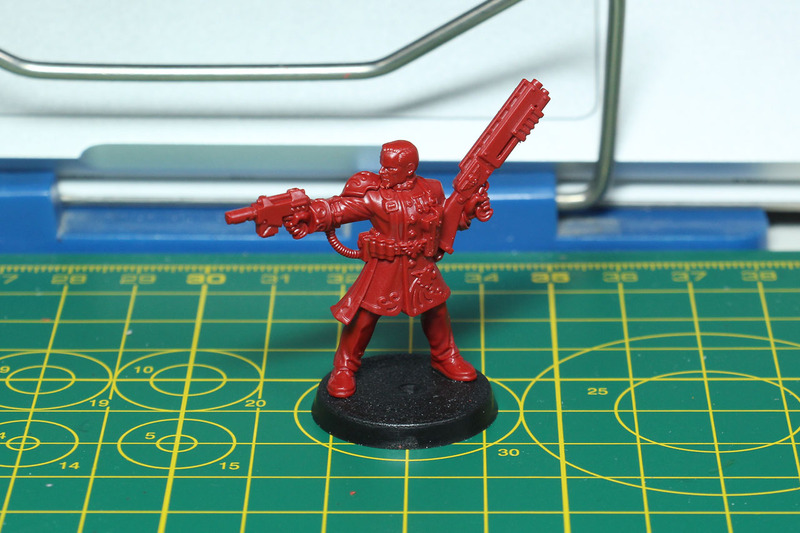 A similar problem with the poses share the regular Voidsmen, all two part models. The one holding the cigarette is interesting, but the heads are stretch at extreme angles, to fit the production abilities of plastic. Has been done better by Games Workshop multiple times and they could have handled that far more dynamic. A quite more interesting pose is spotted by Stromian Grell. 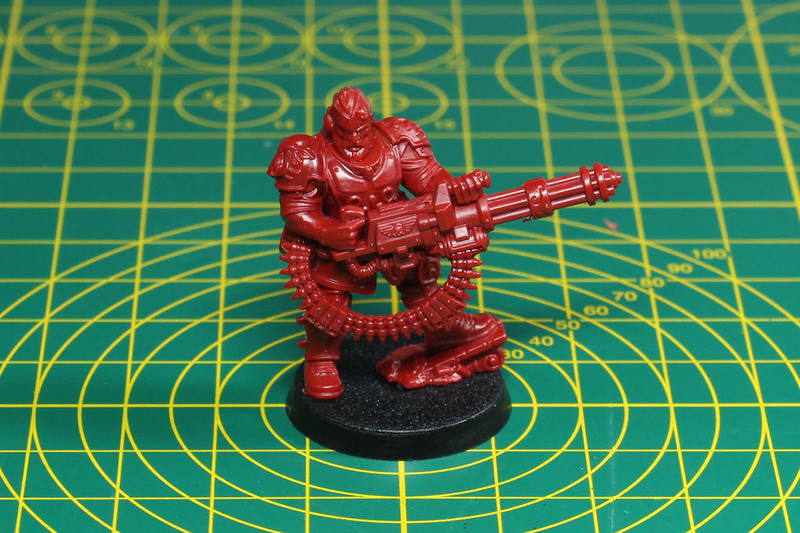 He has his rotor cannon on the hip and a long ammunition belt to feed it. And the squad has their own attack dog, called Aximillion. 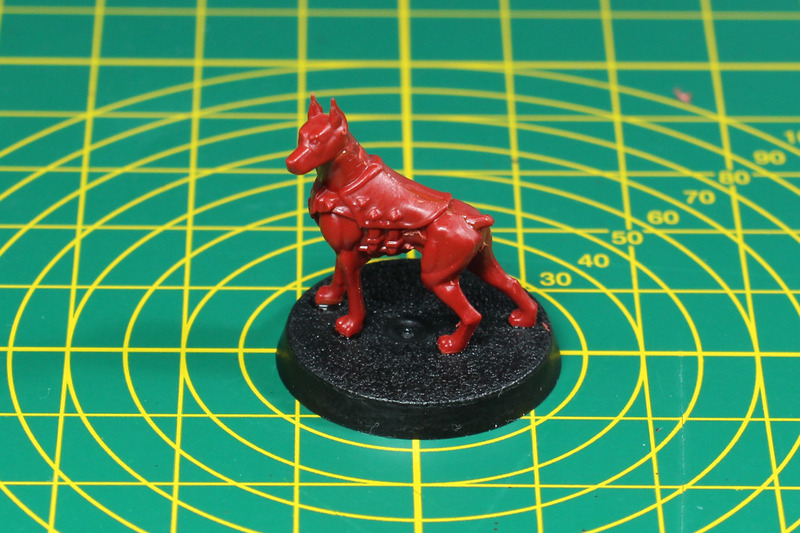 Canids are an ancient terran species and can be found on several planets that were colonised in the Age of Technology. A great characterful addition to the squad. 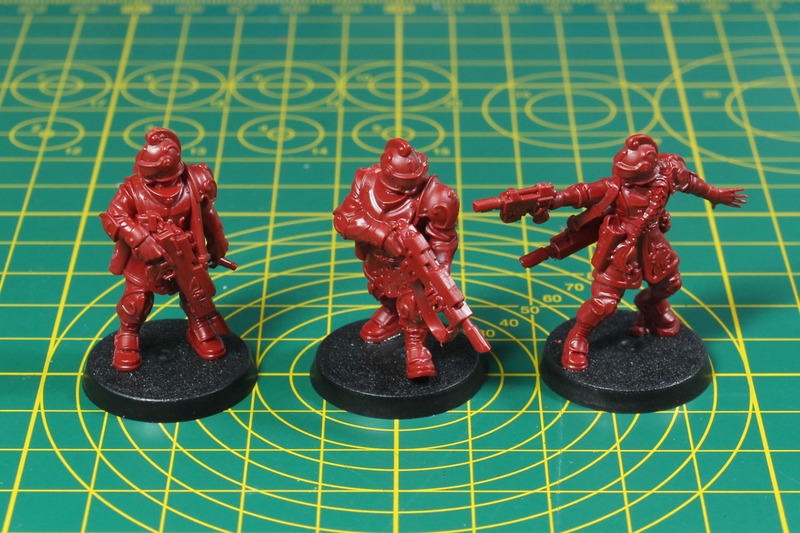 The design of the squad, especially of the Voidsmen uniform is interesting, as it is very distinguished from the other Imperial forces like the Astra Militarum. 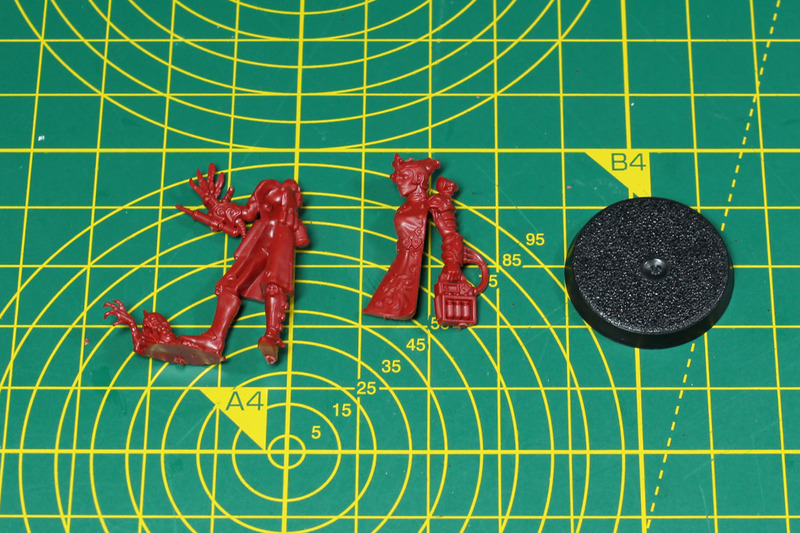 It is a bit sad, that they pressed the whole gang into the medium sized sprue and that they split them in so few parts, as that is noticeable in the final miniatures. A couple of the poses feel quite flat and not up to date. 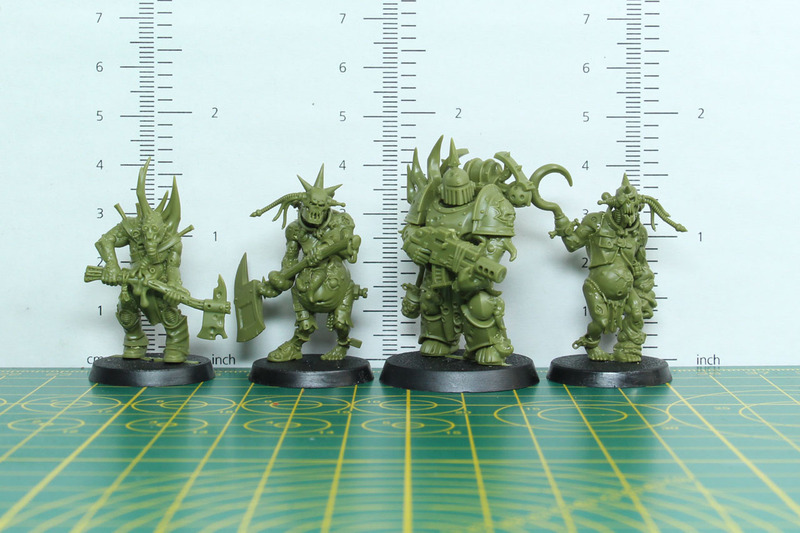 Games Workshop is one of the leading companies in plastic miniatures and understands how to use that medium to its fullest (see many of the easy to build kits), this crew does not live up to their real potential. 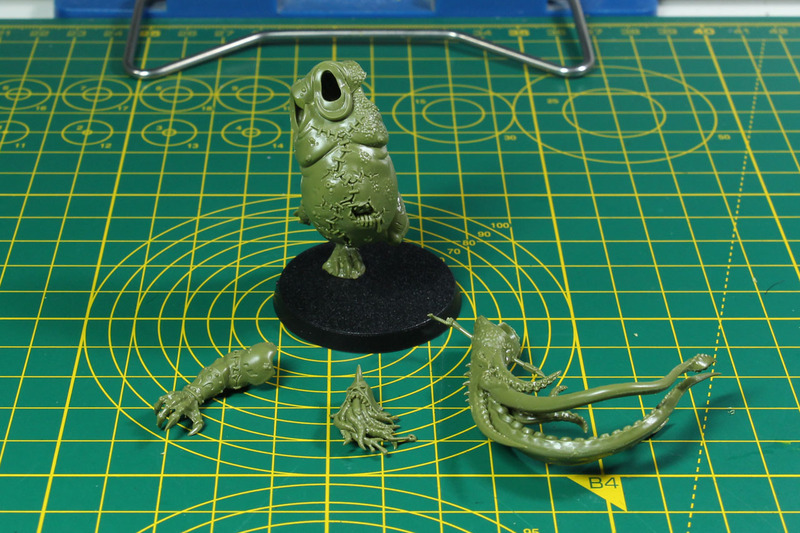 The antagonists of the Elucidian Starstriders are the Gellerpox Infected. 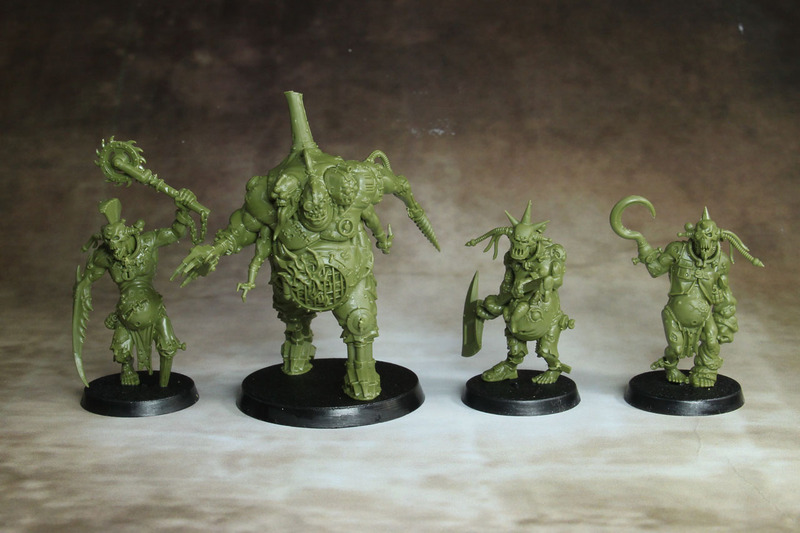 A group of corrupted technomutants, led by Vulgar Thrice-Cursed. 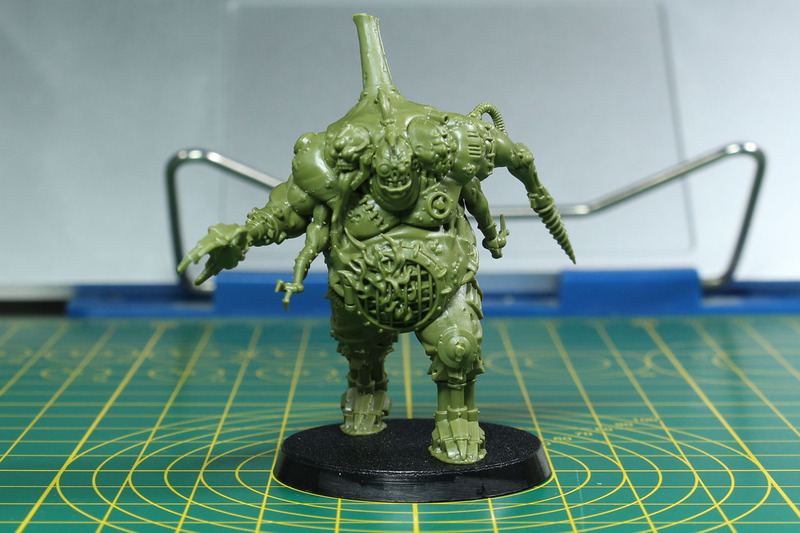 The chaos god Nurgle infected part of the machine crew, and let them mutate into the strangest creatures. 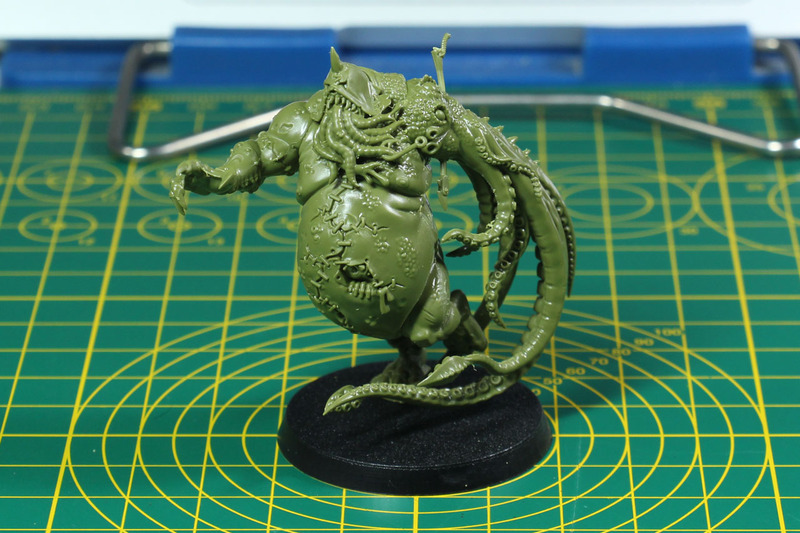 Vulgar was the most blessed and grew by the influence of the corrupted Gellerfeld-Generator into a multi-limbed monstrosity with a belly-flamer and fleshripper claws. A complex but well-fitting miniature. Very impressive in size and the design of the flaming kettle paunch is a very interesting and fitting choice. The former machine crew mutated in all kinds of forms. 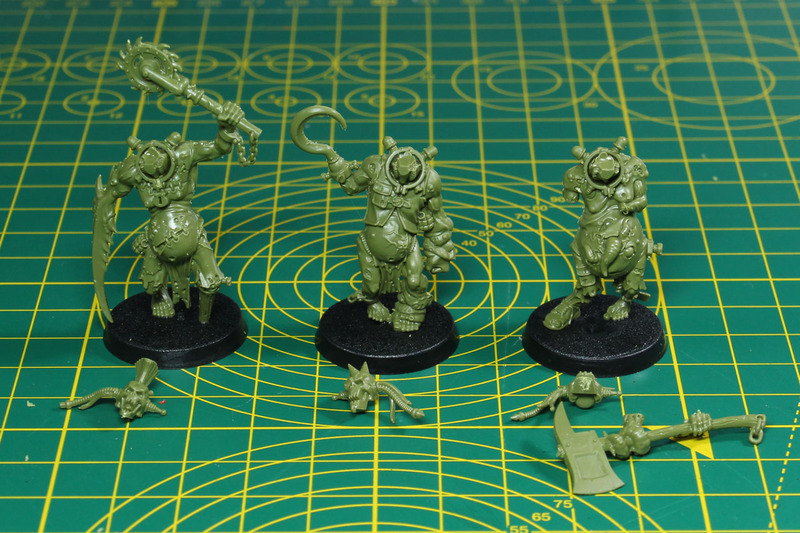 The Vox-Shamblers seem to be former Tech-Servitors, and rather large miniatures, as you will see further below in the scale comparison. 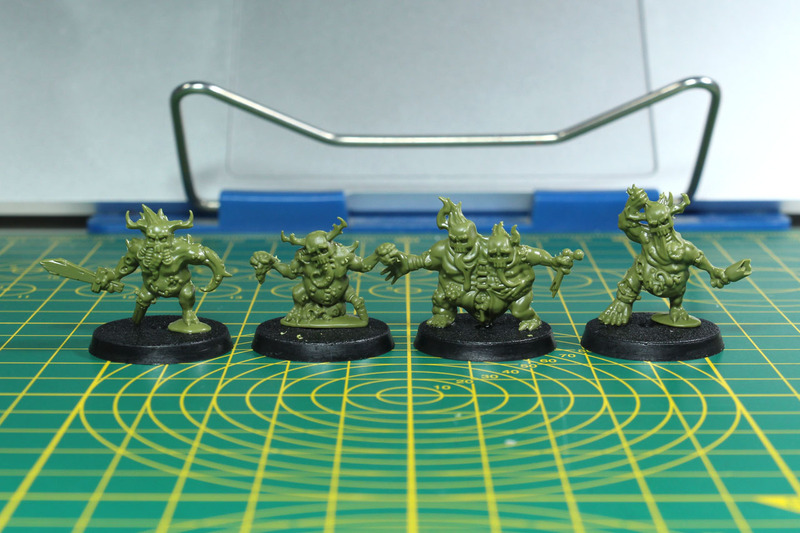 They look a bit like a mixture of Gorkamorka Digganobz and Plaguebearers or Poxwalkers. 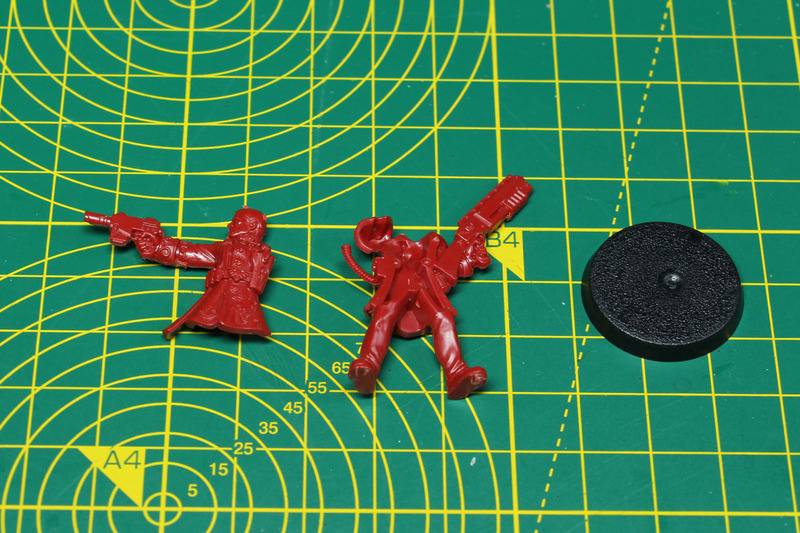 The fit of the multipart miniatures is quite well and they have plastic poses. 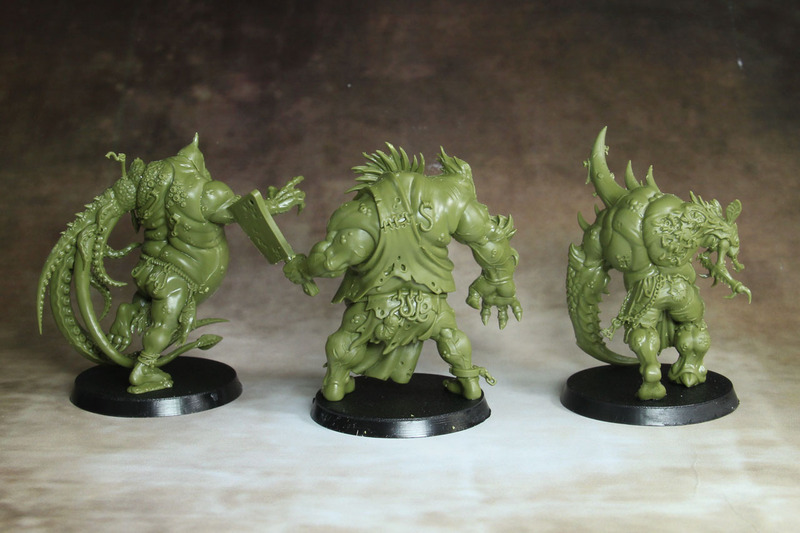 Some of the mutated crew members have become Nightmare Hulks, each weigh a ton and are at least 10 feet tall. The leader of this trio is Gnasher-Screamer. He looks a bit like Leatherface from the Texas Chainsaw Massacre and from his gear, he seems to be the former starship's cook. Impressive and well done pose, with only three parts. The Writher wears a hood and has some sea-connection, as he is pierced with a small harpoon in his tentacle arm and has a large bloated belly that spots fishes. 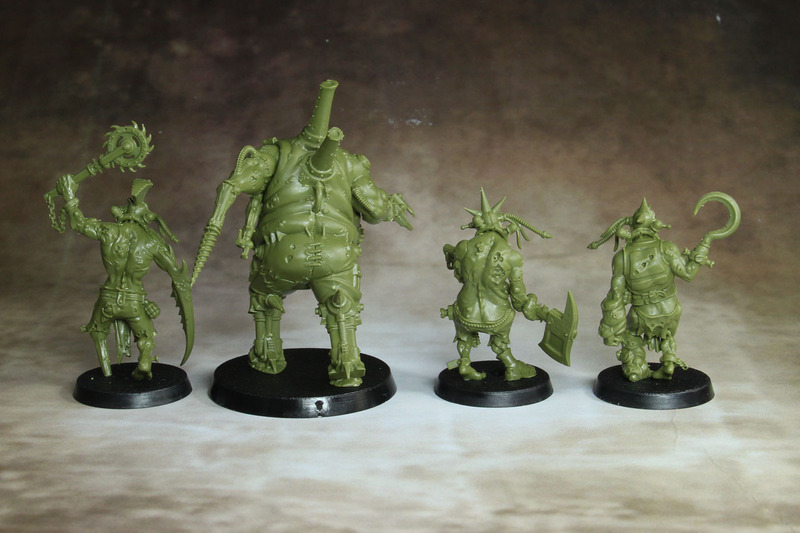 Another dynamic pose of these really huge miniatures. 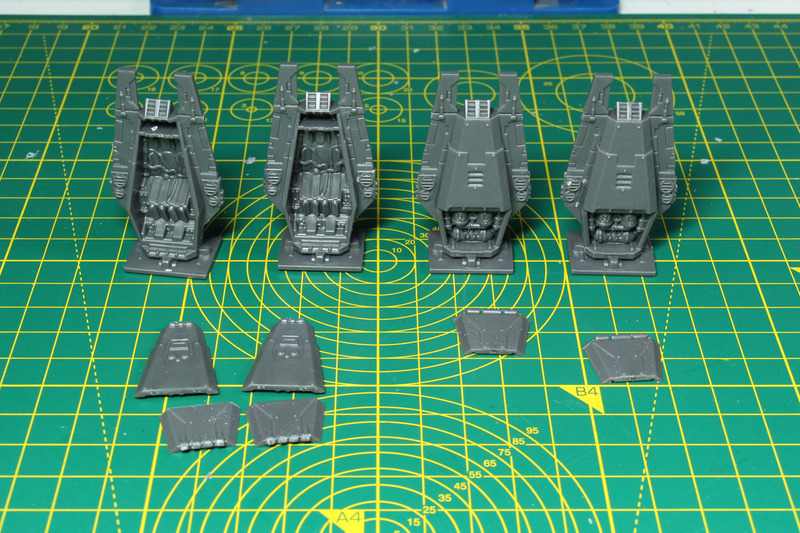 The third Hullbreaker or Nightmare Hulk is Big Spike. 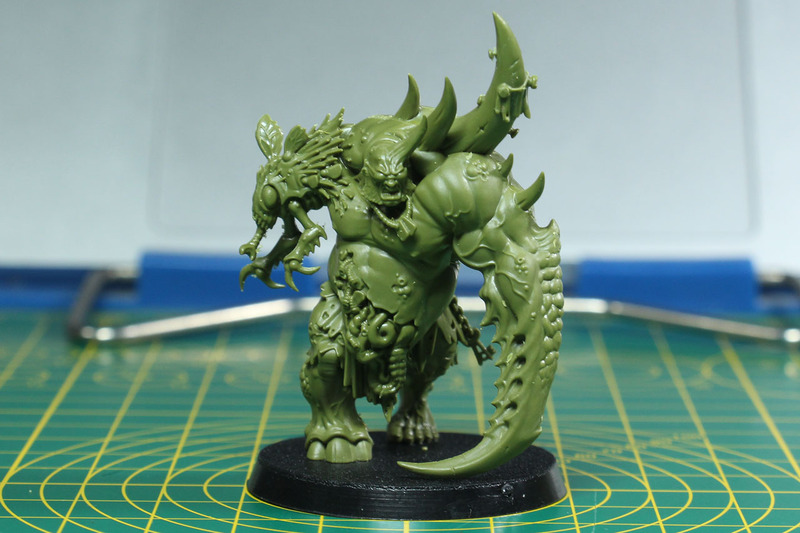 Heavily mutated with a large stinger for an arm and a fly for the other, and wild open wounds and horns all over his body. The dog tags around his neck could be a lead that he is a former soldier / Voidsmen-at-arm. 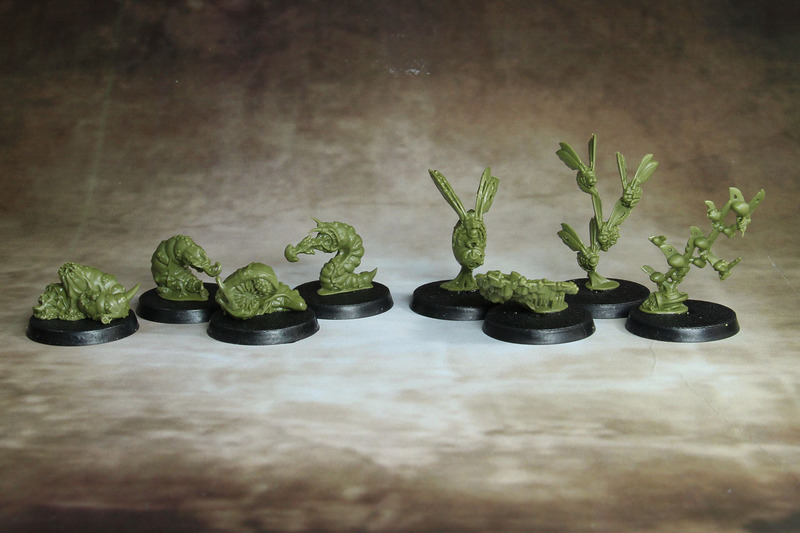 The remaining 16 miniatures of the Gellerpox Infected are critters and vermin in groups of 4. 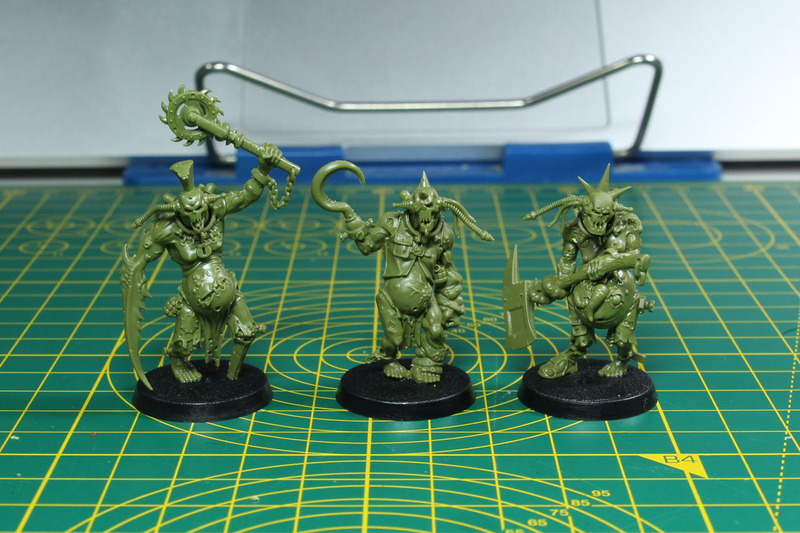 You have four Glitchlings, technomutated Nurglings that make - as the name suggests - weapon and gear malfunction (glitch). Then there are swarms of sludge-grubs, cursemites and eyestinger swarms. Neat addition to the warband and good fillers. 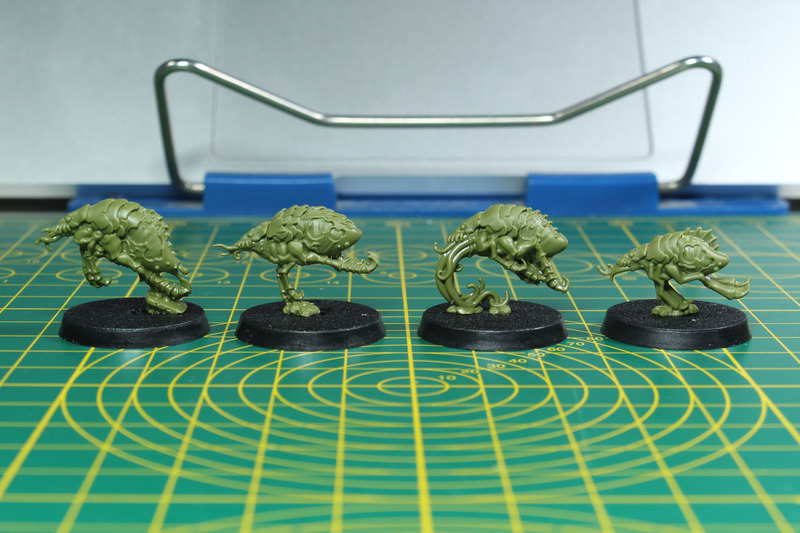 The poses of the Gellerpox Infected are more dynamic compared to the Elucidian Starstriders. 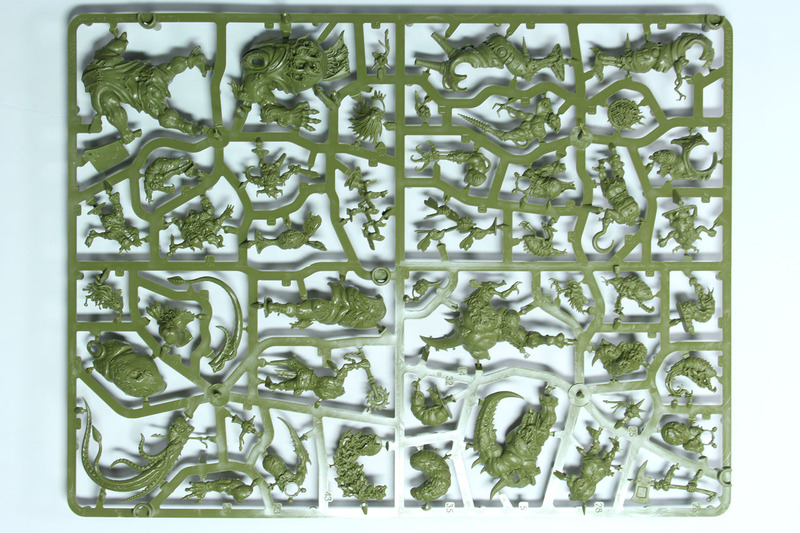 Really saying this box has 33 miniatures is a bit benevolent, as 16 of them are just swarm miniatures. 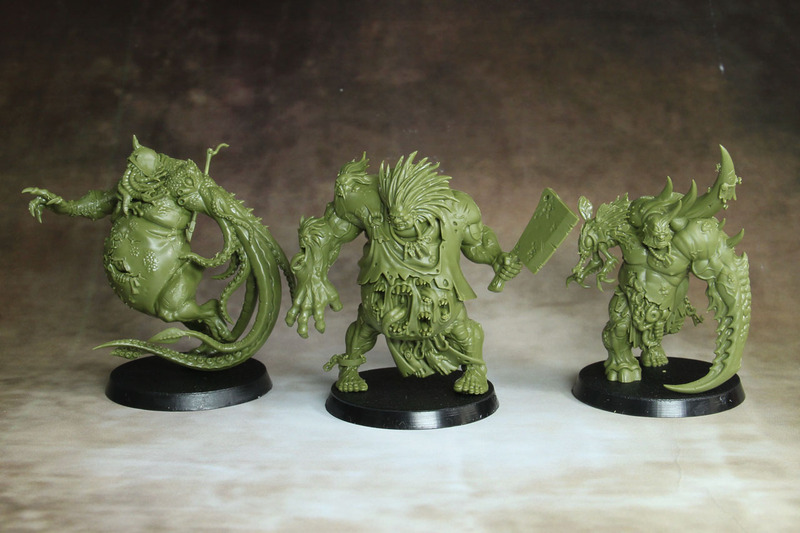 The Nightmare Hulks are insanely large and the three share no common design beside their size. 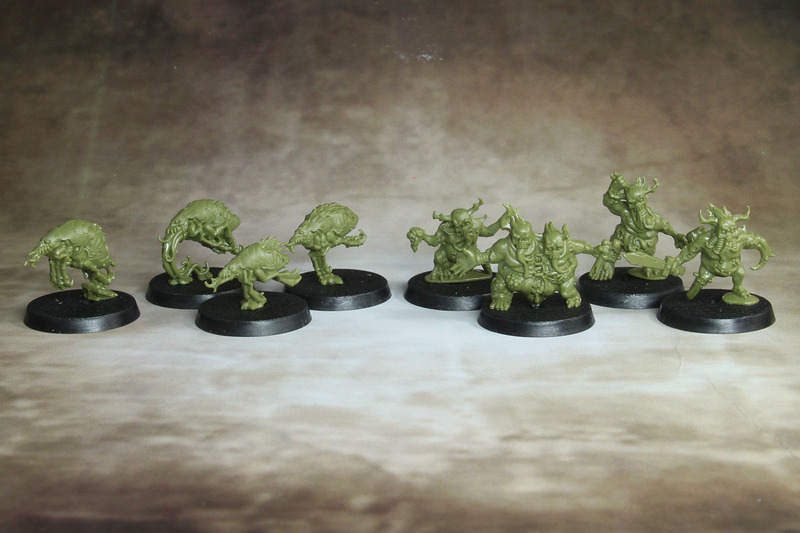 It would have been an interesting option to drop the vermin from 16 to maybe 8 or 12, shrink the hulks by a bit and use the space for 2-3 more poses of the Vox-Shamblers or something similar, like more obvious corrupted crew members. The Truehawk is a small shuttle of the Elucidians Starstriders and used as a new Kill Zone using the Ultra-Close Confines rules. 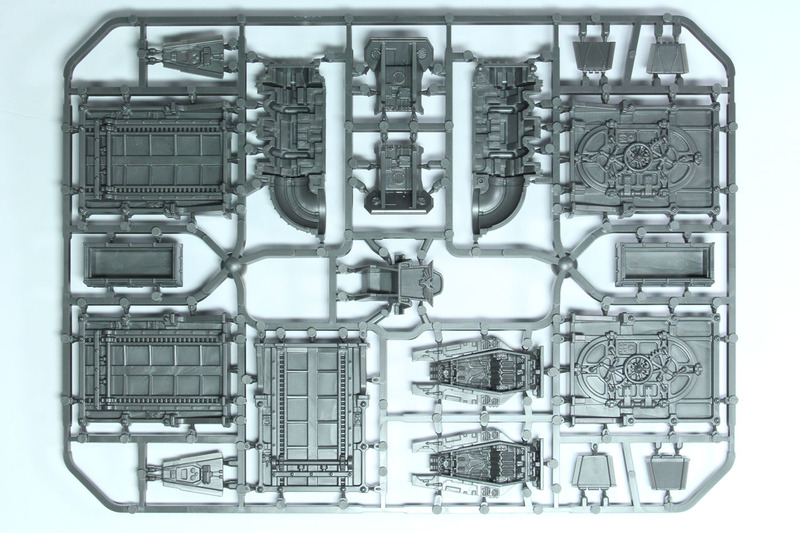 I can see these used along with the Necromunda boards for some underhive or in-house battles. 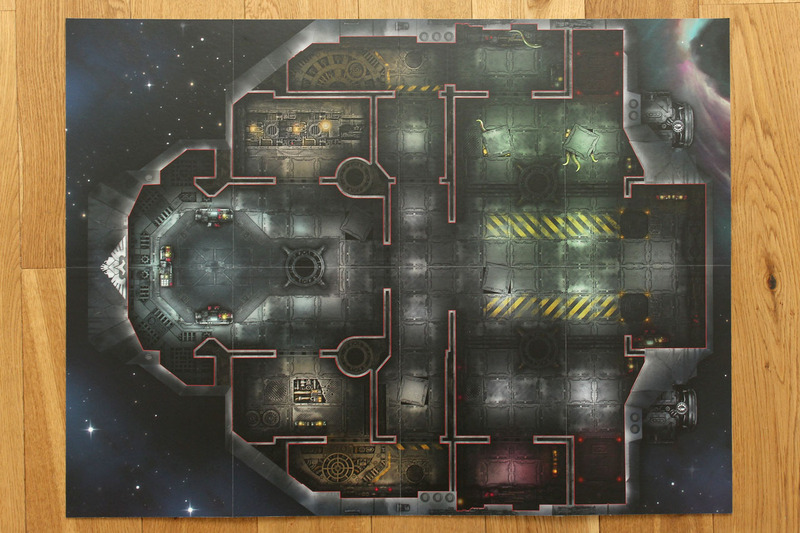 The board brings back a bit of the feel of Space Crusader / Star Quest. 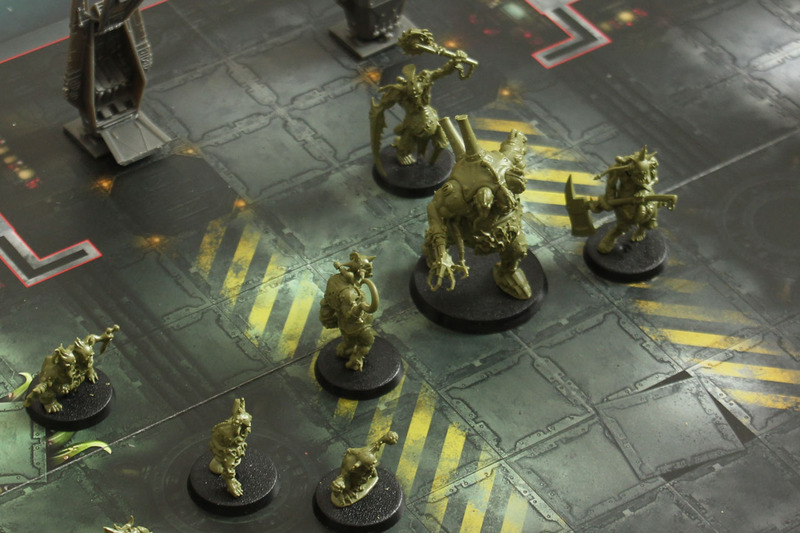 The terrain lacks the typical Warhammer 40.000 design and is surprisingly generic. 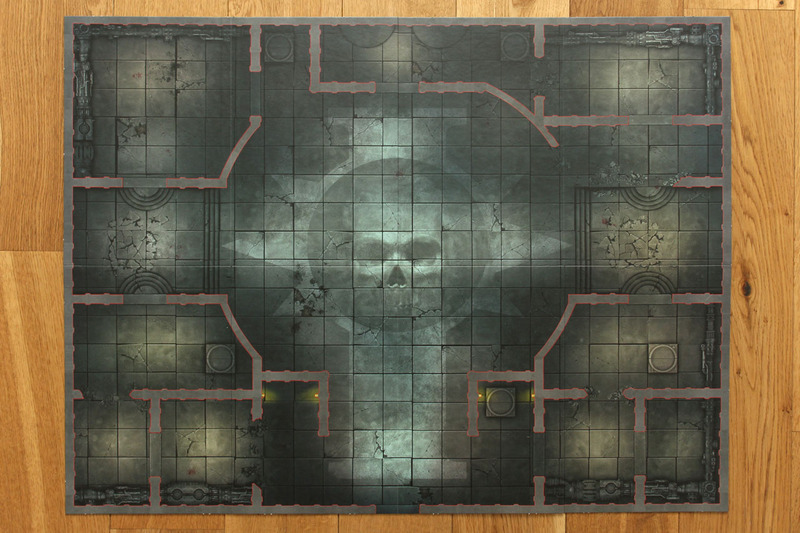 The only skulls are on the doors as part of the mechanicus iconography and there are no aquila / imperial eagles on the pieces them self (only on the battle board). 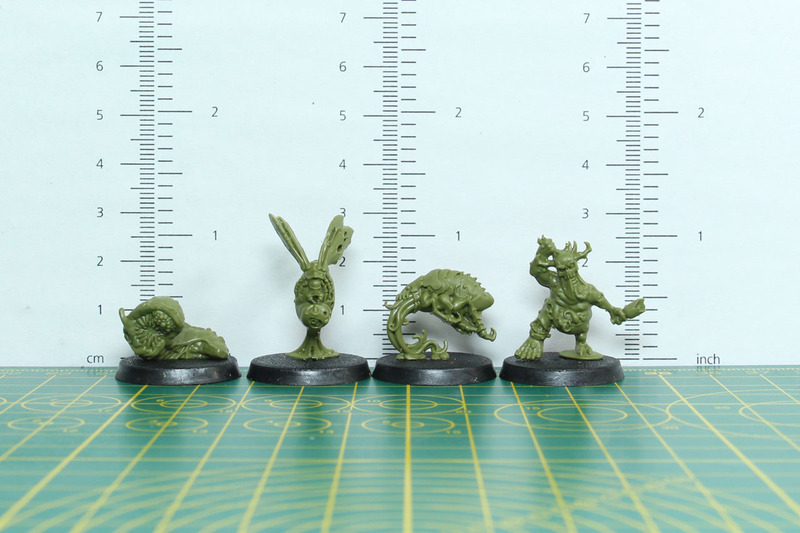 An overview of the miniatures scale wise. 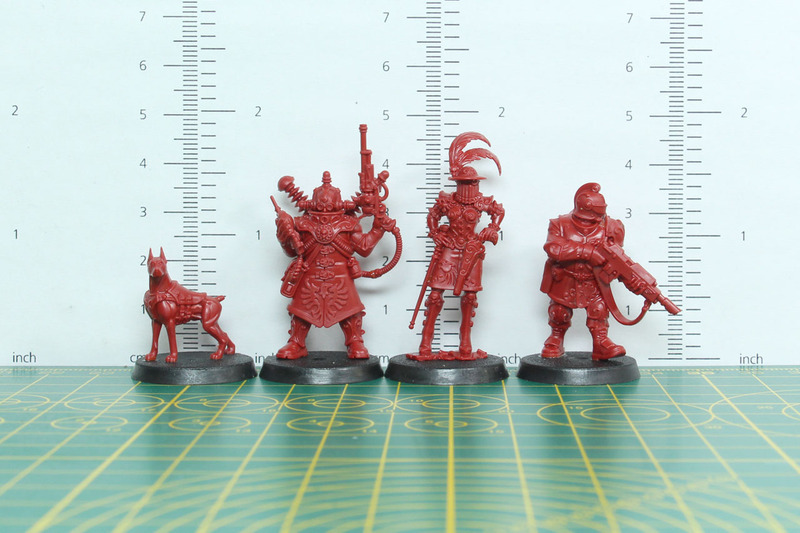 The new Chaos miniatures are quite huge. 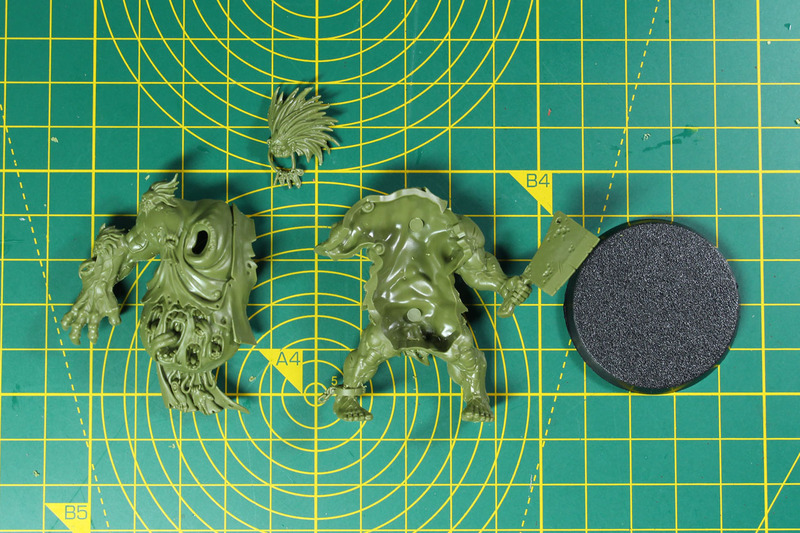 The Nightmare hulks are freakishly large, bigger than Ogryns and even the Vox-Shamblers are larger than Poxwalkers. 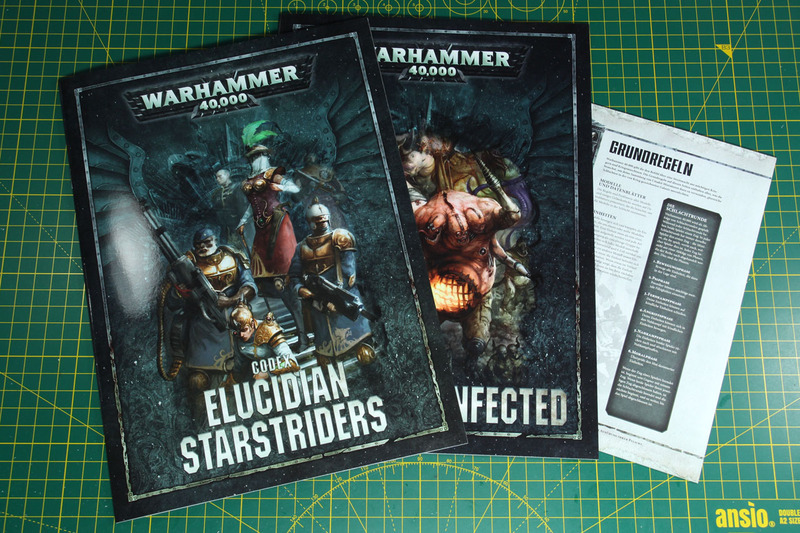 As for the Elucidian Starstriders, they fit within the newer models. The poses are as mentioned above rather static. 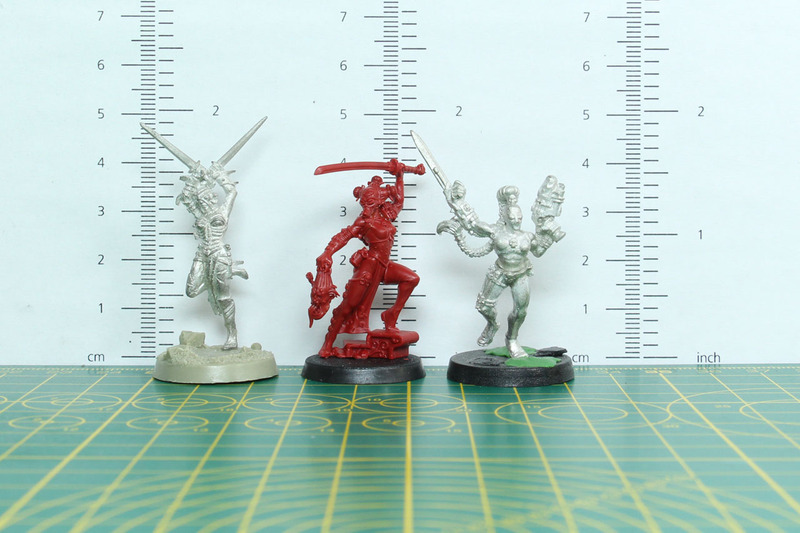 Elucia herself is among the largest female miniatures and the remaining crew is taller than other imperial human miniatures. 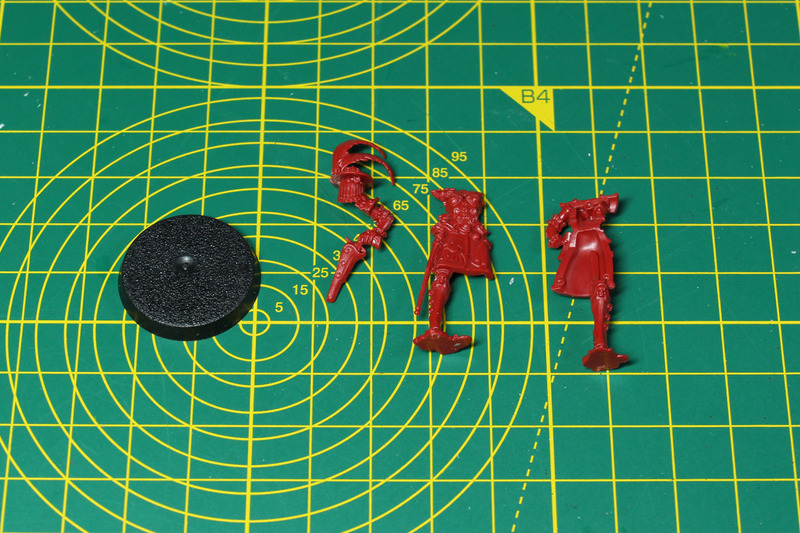 As you can see in comparison with an Inquisitor or Imperial Officer of the Fleet. 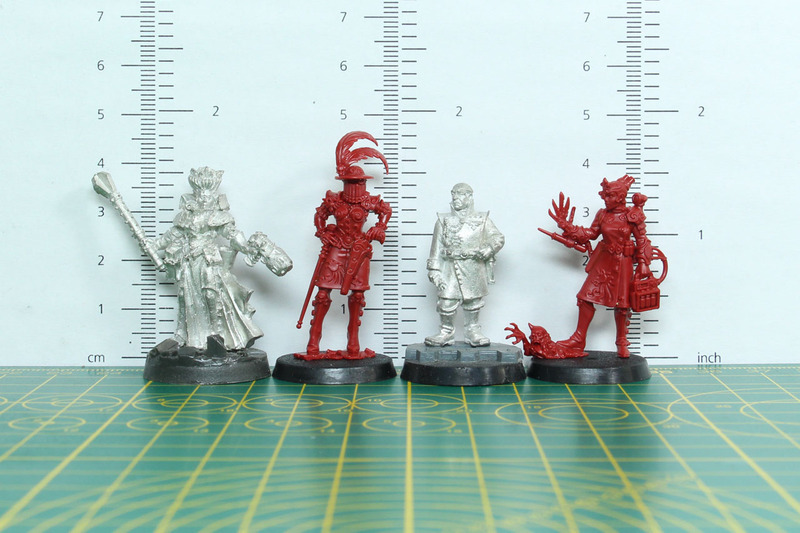 Knosso Pront fits well between the other Assassins and the Voidsmen-at-arms are larger than Imperial Guardsmen by Games Workshop or Titan crew men of Forge World. 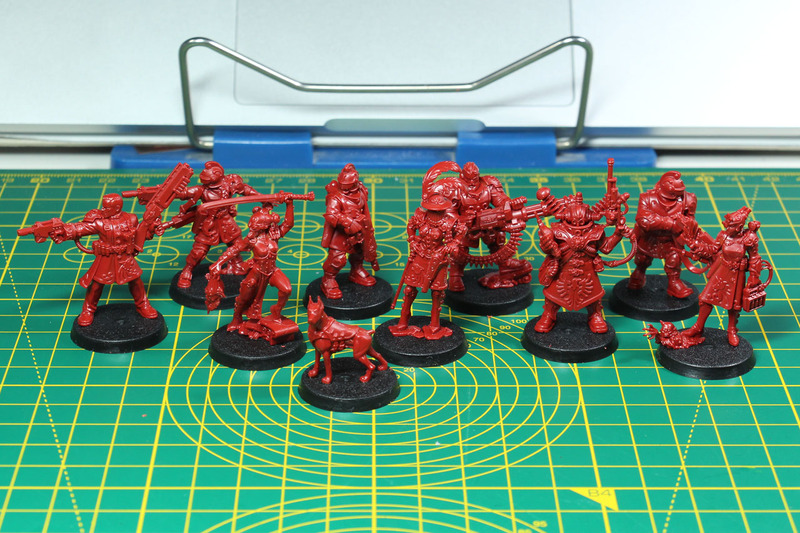 And the assembled warbands of the Elucidian Starstriders and Gellerpox Infected. It is a bit difficult to come to a conclusion with this box. 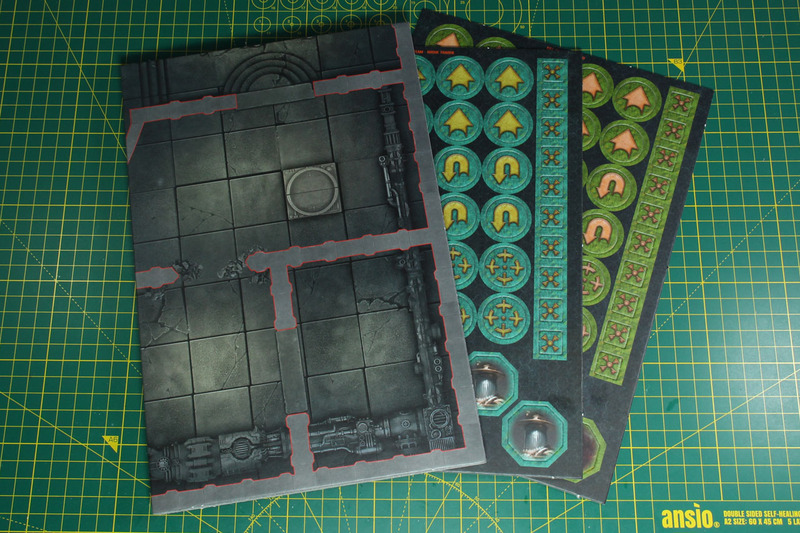 Per se, as a box covering two Kill Team factions and a new Kill Zone it is grad B. Not good enough for an A, but solid enough to not be a C. Why? 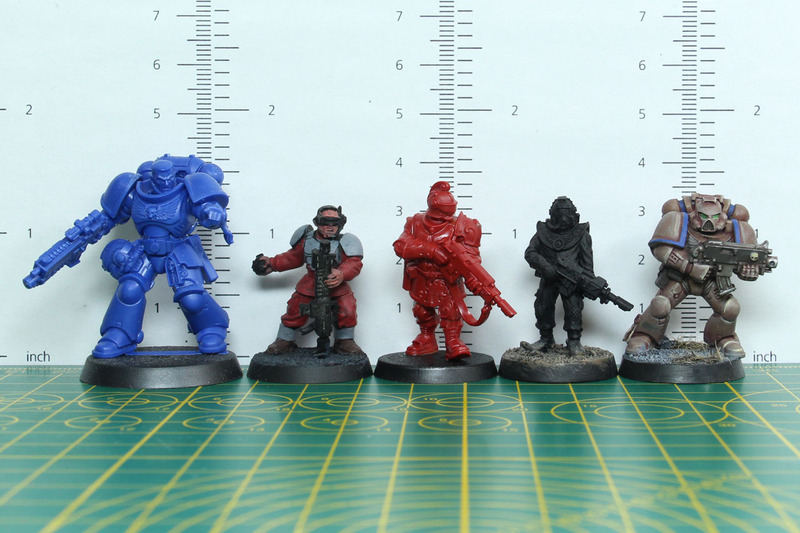 Well, Rogue Trader was teasered for a long time and even around a month before release on Warhammer Fest Europe it was not really clear, that this box would not be a Stand-Alone and "just" be an expansion set to Kill Team. I am not alone with this, as the introduction on the pre-orders is rather clear and many people that I talked with about the box were only recently made aware of that or became aware during the chat we had. So the general assumption was something along the lines of at least a space dungeon crawler (see the Space Crusader / Star Quest link). 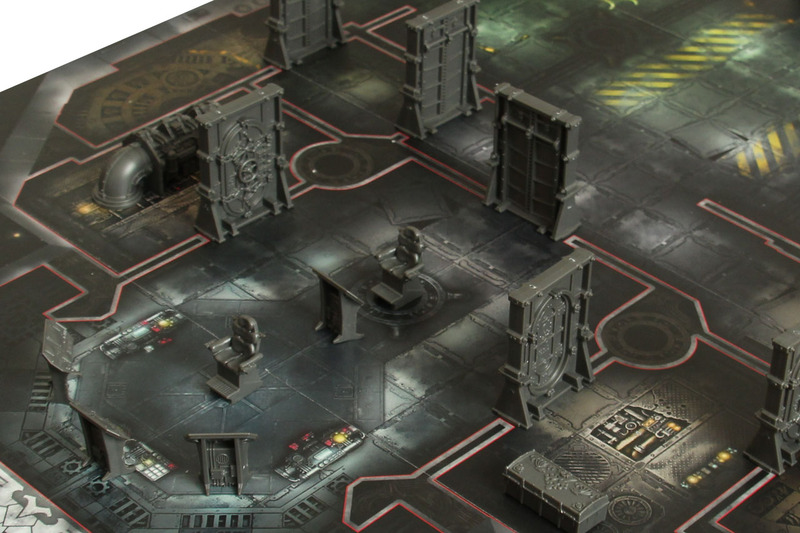 A product you would see in a toy store and was a self-containing product like a board game, but with a connection to the Kill Team world / rule set. 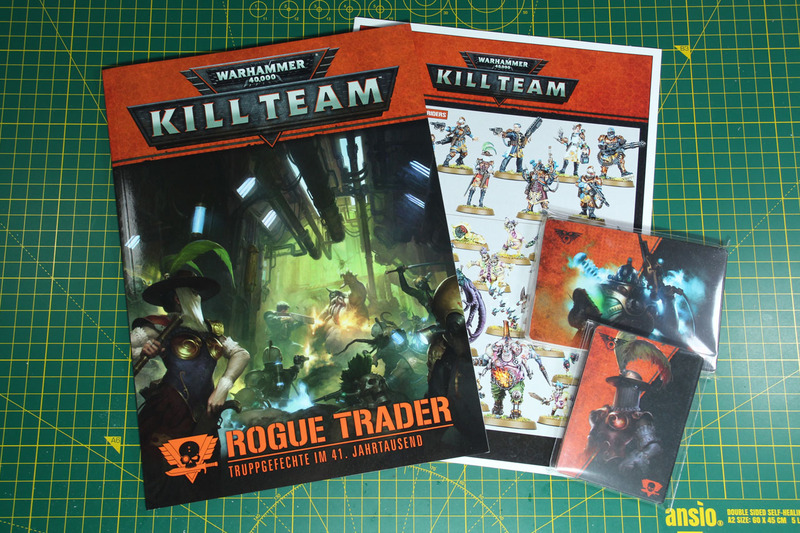 So to use this kit, you have to invest more money to play it by the Kill Team rules, and as the commanders rules are only truncated in this book (but will be covered in an upcoming, next supplement for Kill Team), I am not sure that this fits the expectation of the image of Kill Team that was projected when the game was introduced. Meaning, we have an entry level game, a skirmisher that should be compact (in needed size, space and so on) that already "requires" three books and a couple of card decks for commanders that have to be bought individually. This does not transport a lean feel to the game, quite the opposite - bloated comes to mind, which is rather sad. 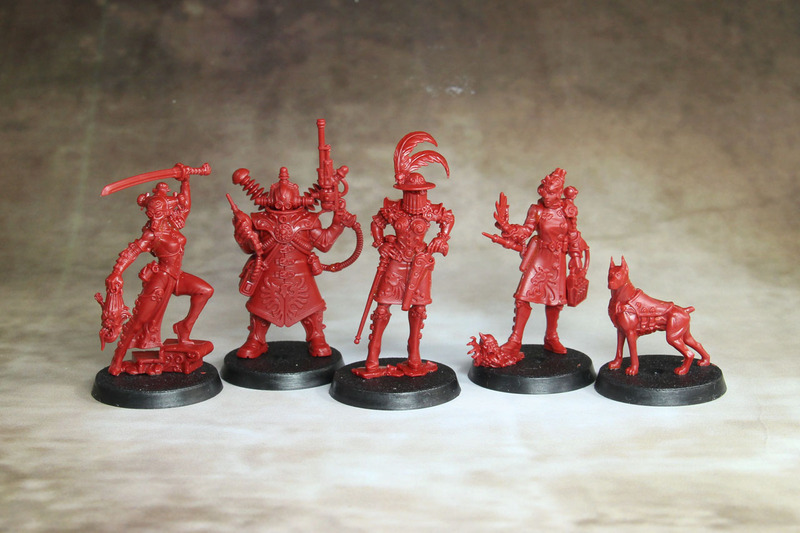 I expected the rules for the Rogue Traders to be more generic to field my own warband, similar to the RPG or the popular Inq28 / Inquimunda scene. 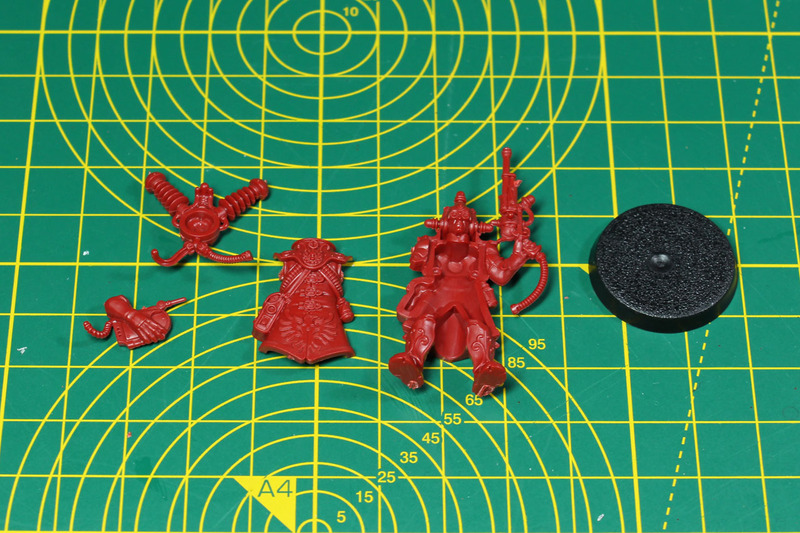 On the other hand, if you approach Rogue Trader as a Warhammer 40k boxed set like Tooth & Claw, it comes with two codices for the two warbands and a small core set of the rules. A good starting point to get a feel for the game. Miniature wise I have a divided opinion. The Elucidian Starstriders are not per se bad models, they just don't live up to the potential that Games Workshop can produce. 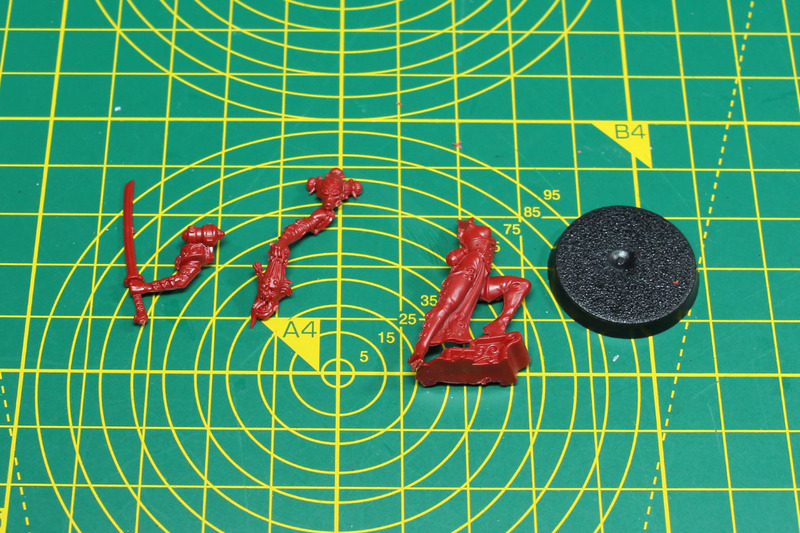 The poses are flat, which is something that had to be done 10-20 years ago to fit the single piece miniatures (or maybe 2-3 pieces) into the sprue. 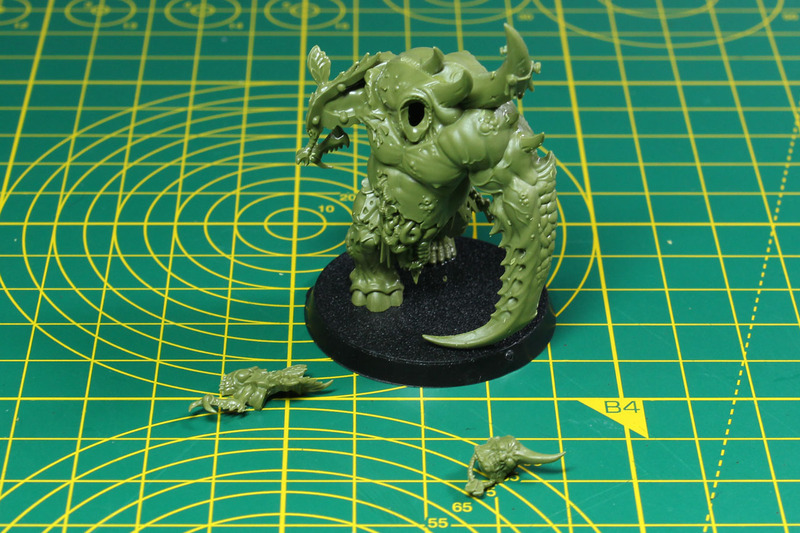 They can do so much better, more dynamic poses, as can be seen from the new easy-to-build kits for Underworlds or Age of Sigmar. 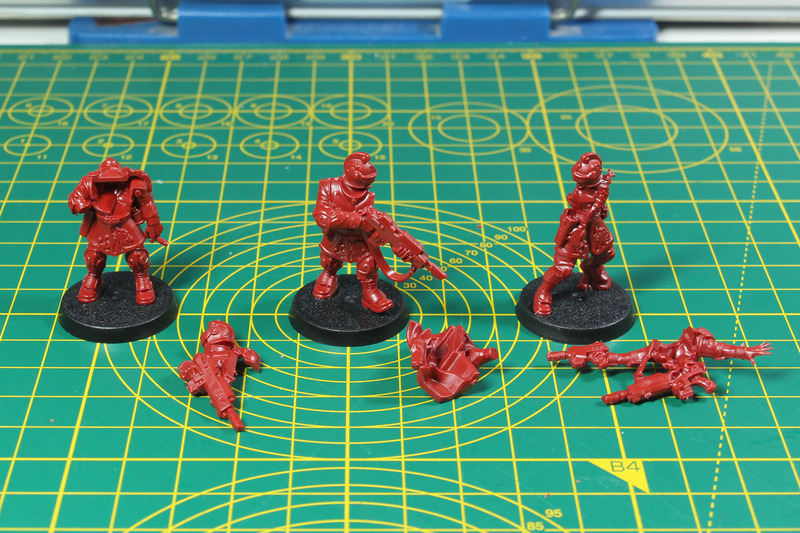 Simply having the heads as individual pieces that can be assembled in a slightly less stretched angle would have improved some of the poses a lot. 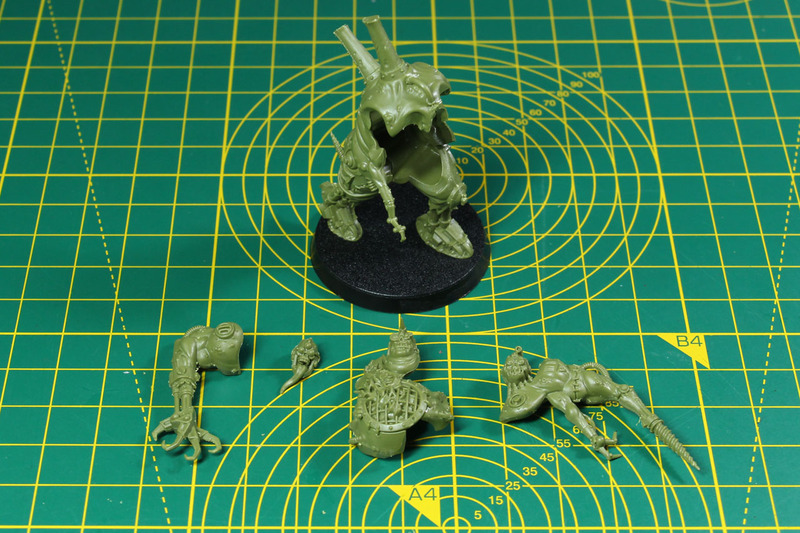 The sprue for the Gellerpox Infected is twice the size, why did they save with the Rogue Traders? 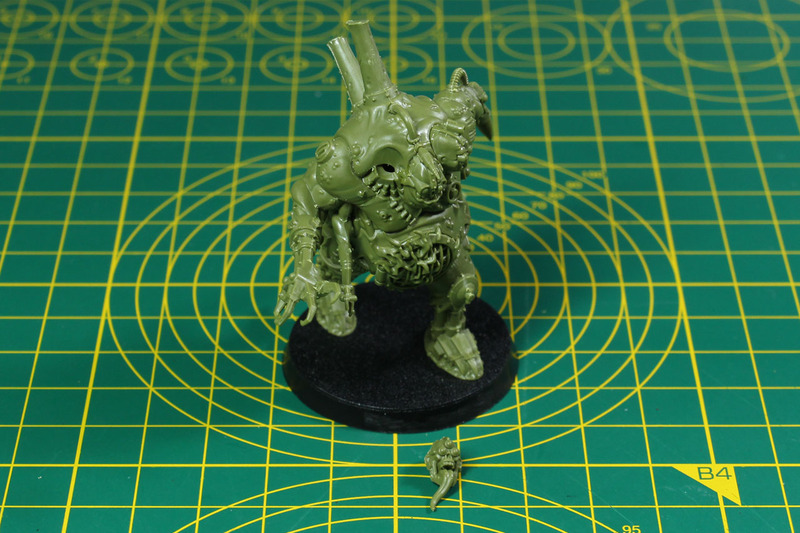 As for the Gellerpox, the models feel a bit unconnected to each other. 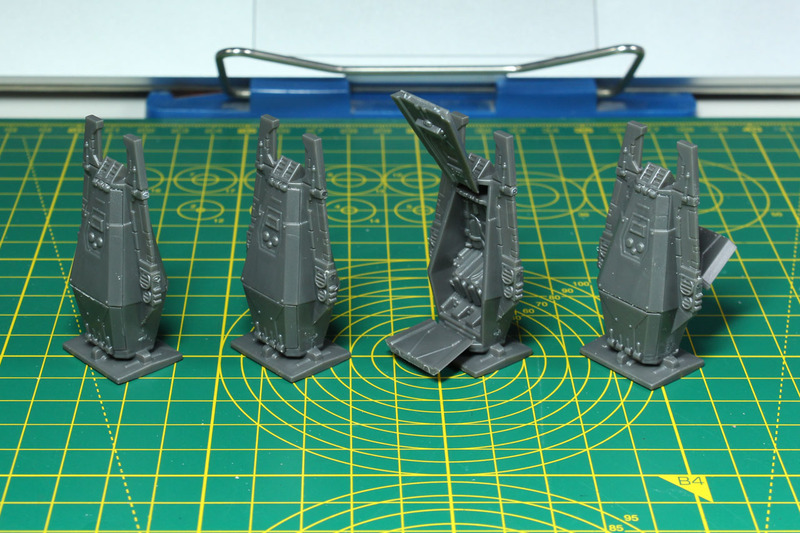 More dynamic poses, much better than the Starstriders and good use of the sprue, but I do not get the scale creep, why they are so big. 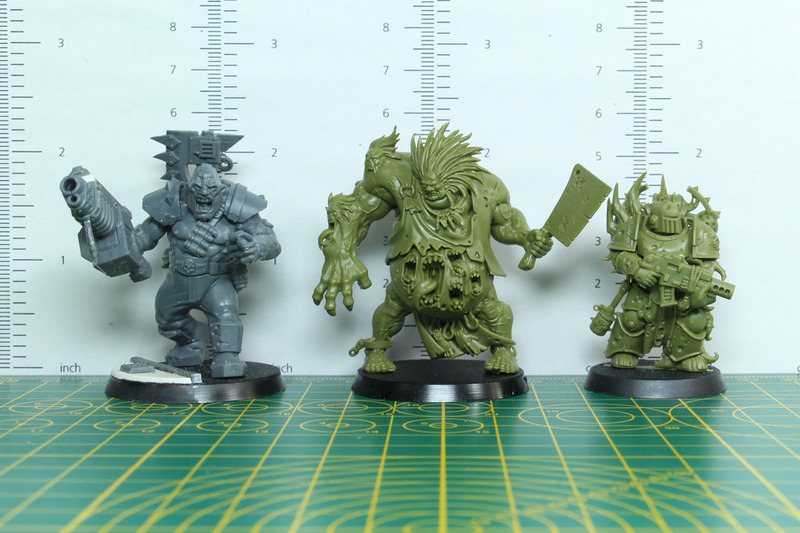 Making the Nightmare Hulks the size of Ogryns would have been sufficient, same with the Vox-Shamblers, keeping them on level with the Pox-Walkers would have been fine. 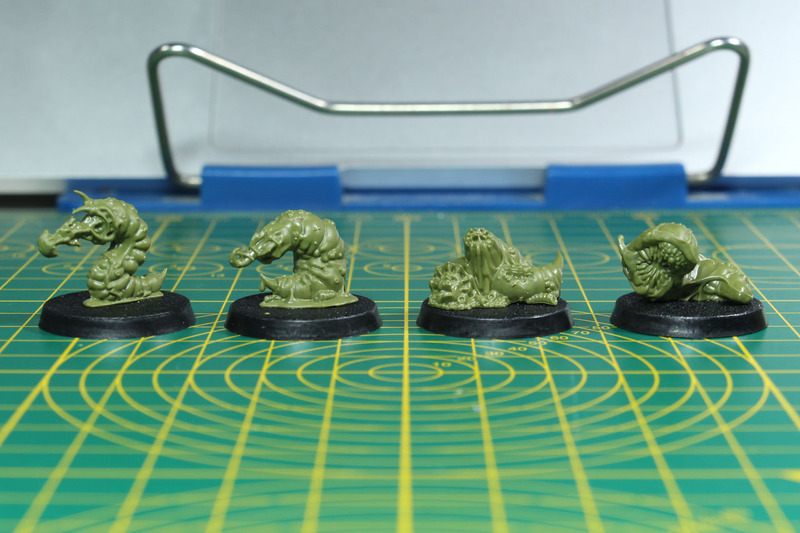 The Hulks them self are well made models, but have no design connection to each other and feel a bit ragtag. 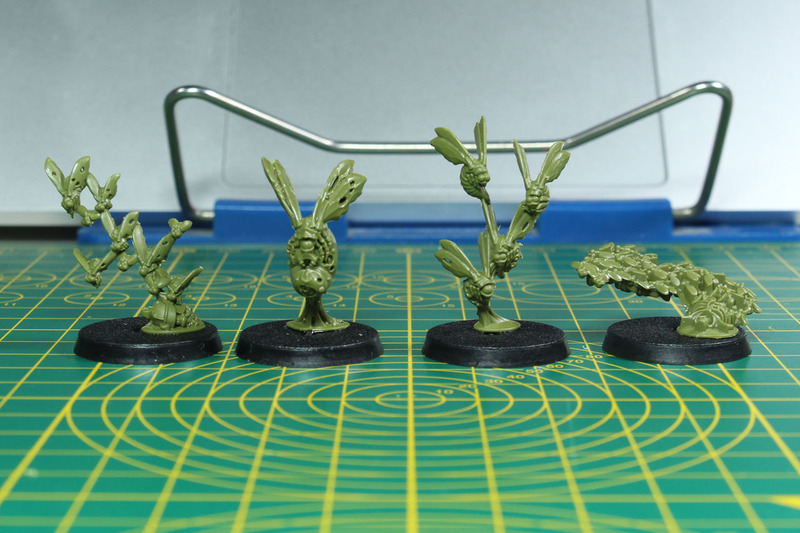 As do the Vox-Shamblers, they have clownish features. 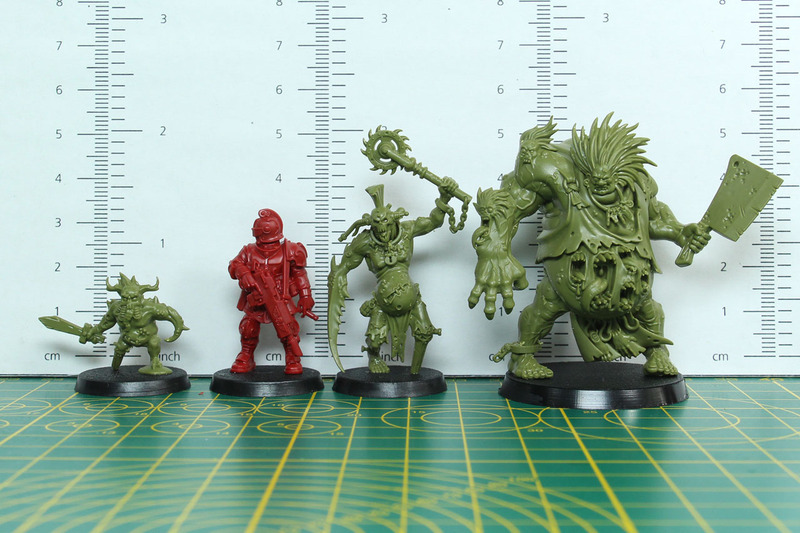 So scaling them down to the size of the other relatable miniatures from the range would have made space for more miniatures, making the warband a bit more diverse or coming closer to the design theme of mutated crew members. 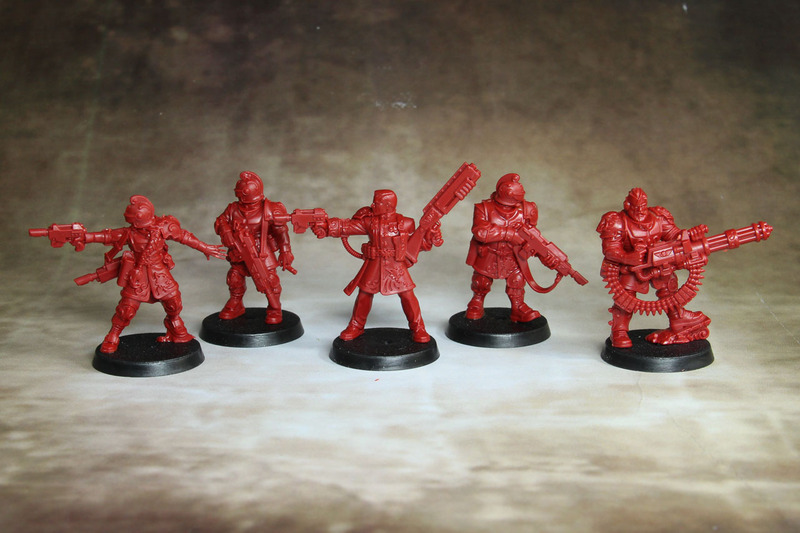 Rogue Trader is an expansion set for Kill Team and costs 105 EUR. Seen as an introduction to Warhammer 40.000, compared to boxes like Tooth & Claw or Forgebane, that is a good deal and cheaper with a more special focus on small scale games. 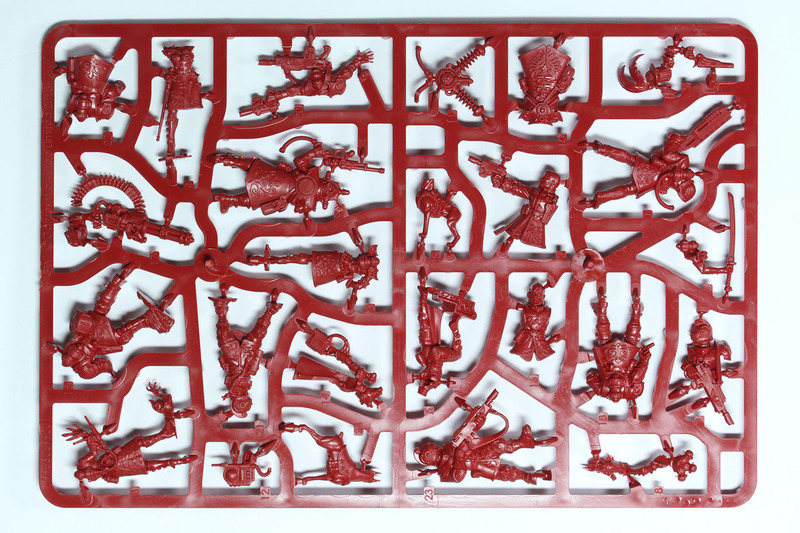 As a Kill Team expansion, keeping in mind, that this is not a stand-alone, a price of around 80 EUR would be more appropriate. Warhammer 40.000 and Kill Team are brands by Games Workshop.